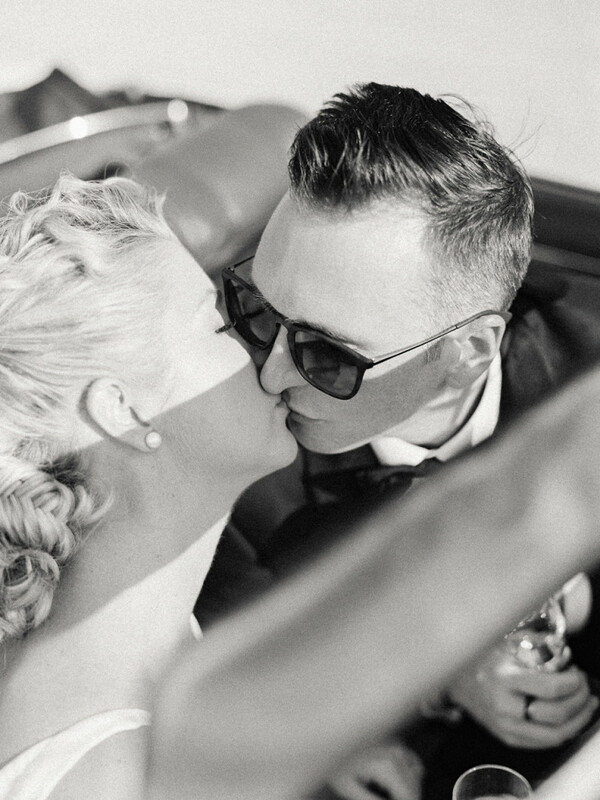 Once in a while I get the chance to meet with a couple that has the wildest, most exciting ideas, and we get to make every single one of them come to life! 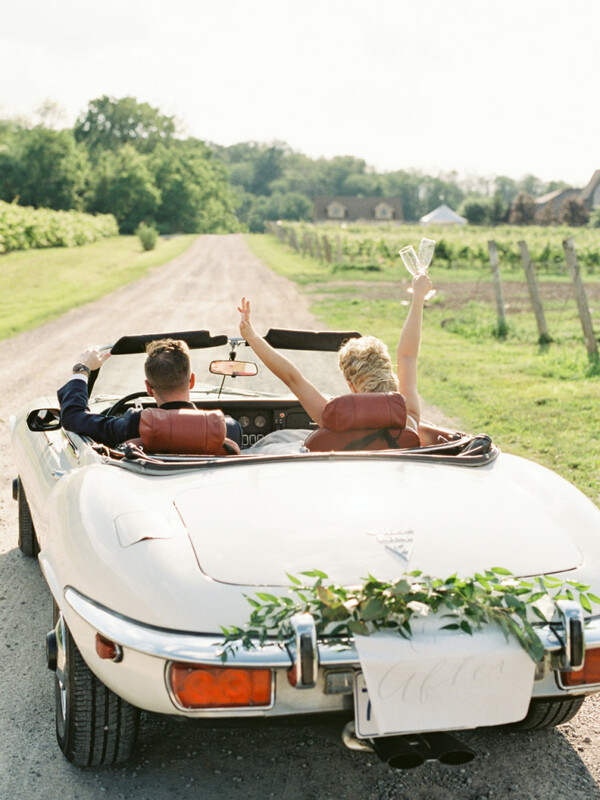 This was exactly the case for Melanie and Carey, who were married in early July at a lush Niagara winery. 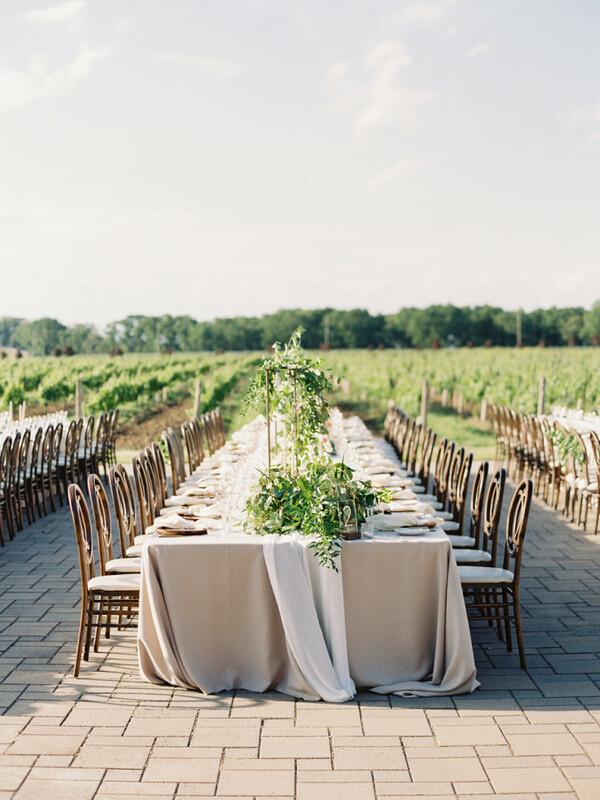 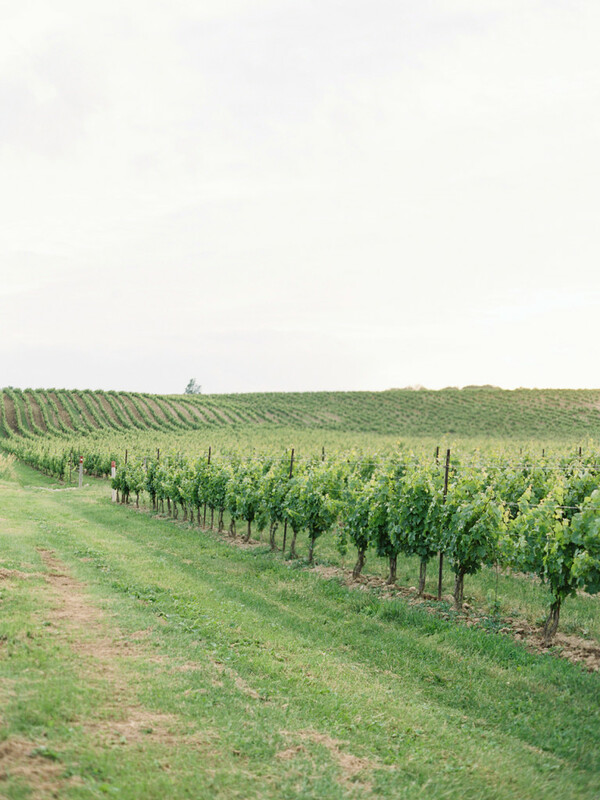 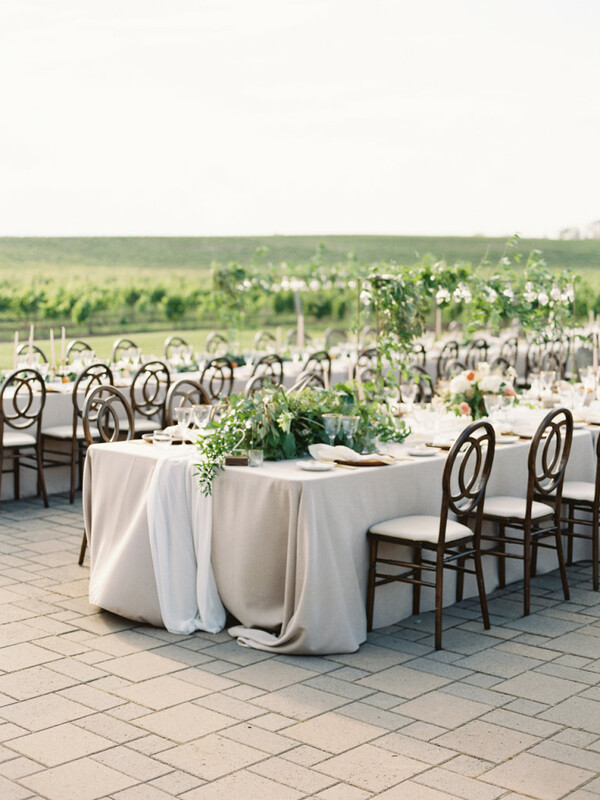 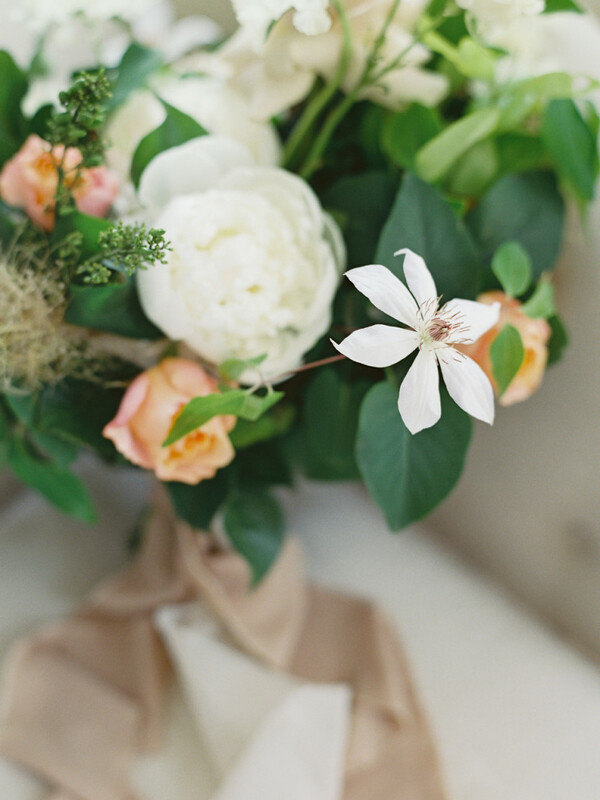 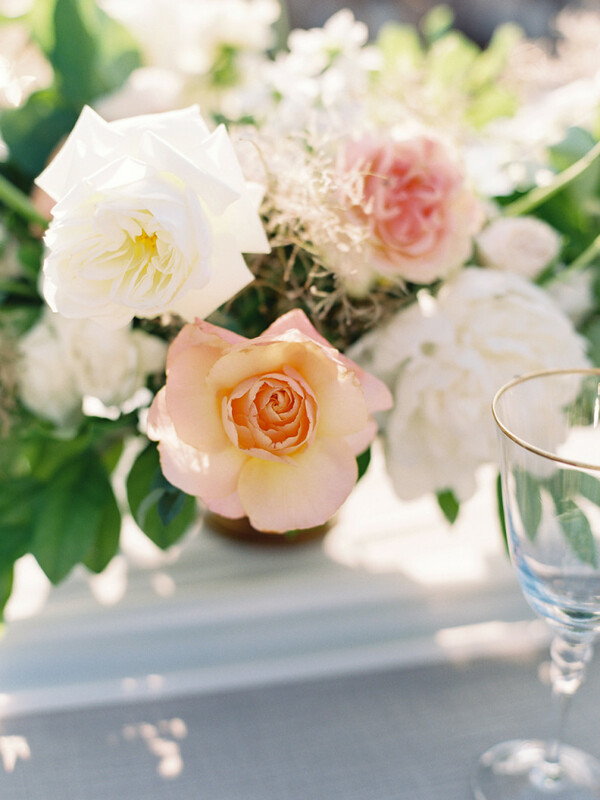 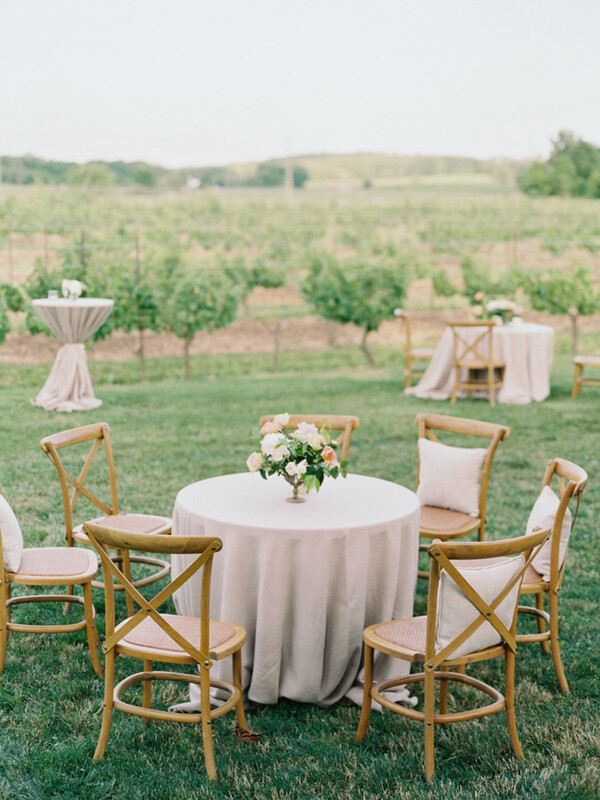 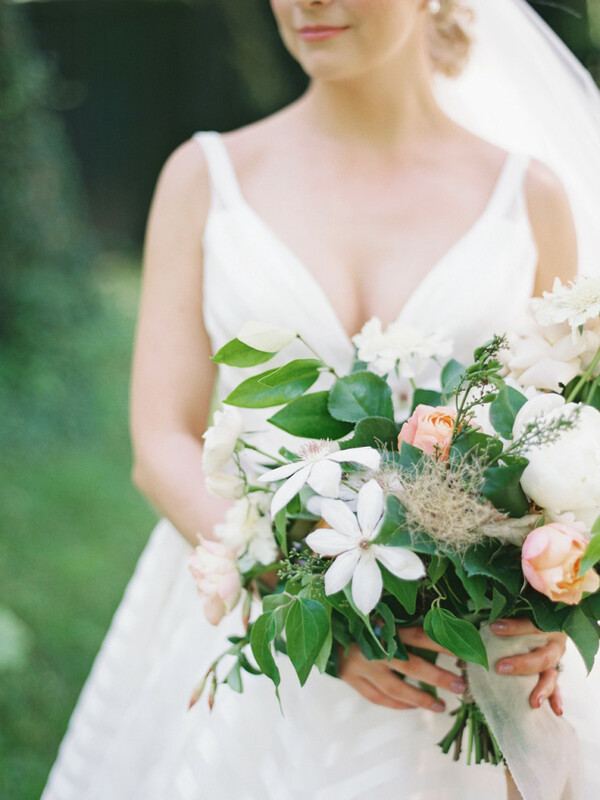 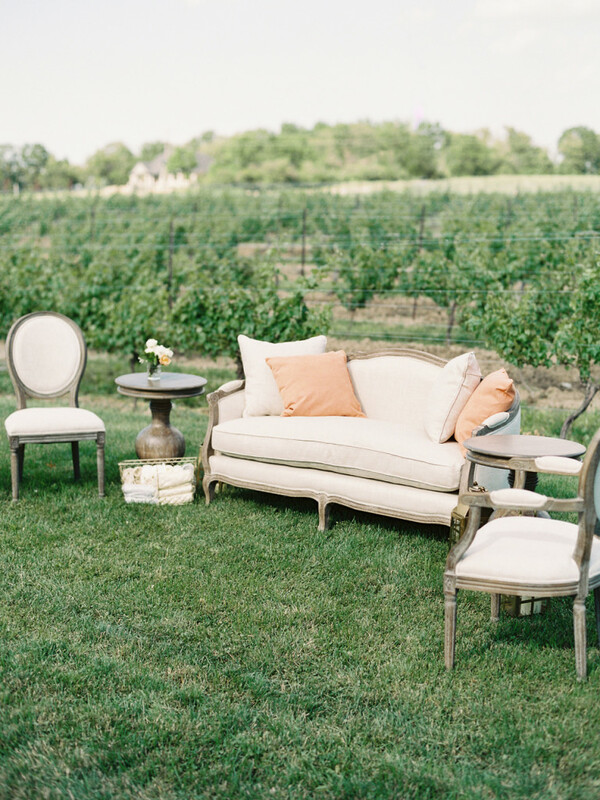 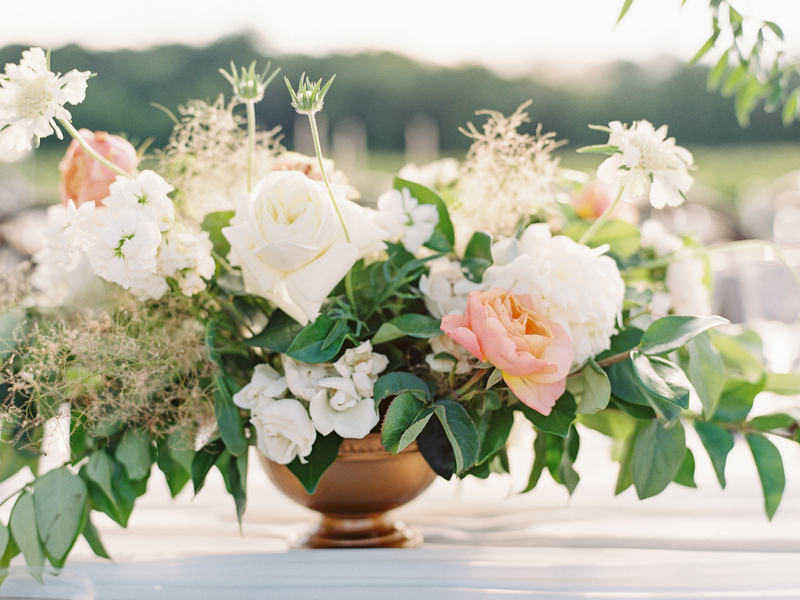 This vineyard wedding was one for the books, photographed by Reid of When He Found Her and planned and executed perfectly by Danielle of Shaw Events. 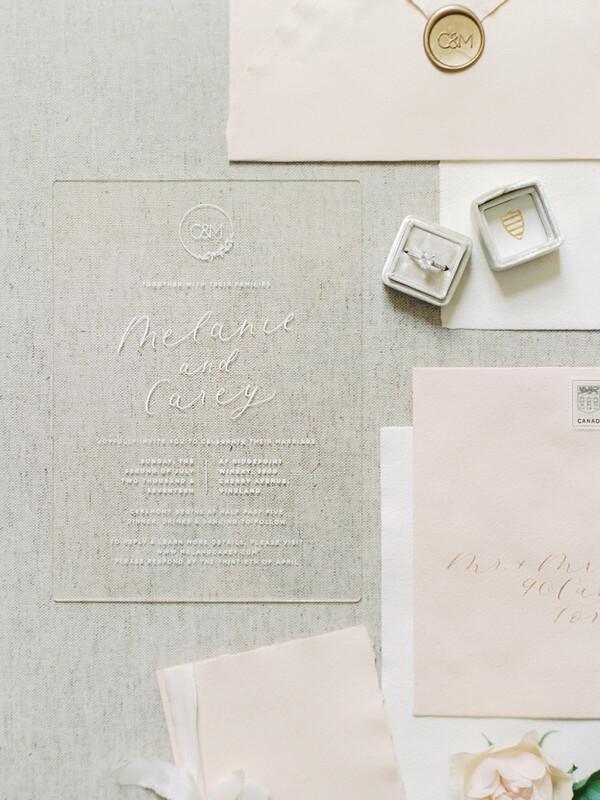 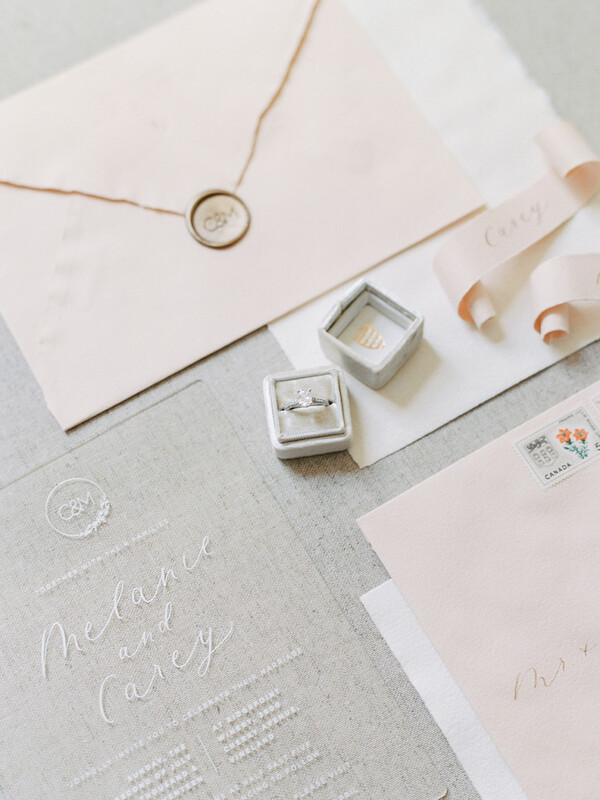 Melanie and Carey’s wedding invitations were ultra-modern, printed in white ink on lucite and featured a branded monogram with their initials. 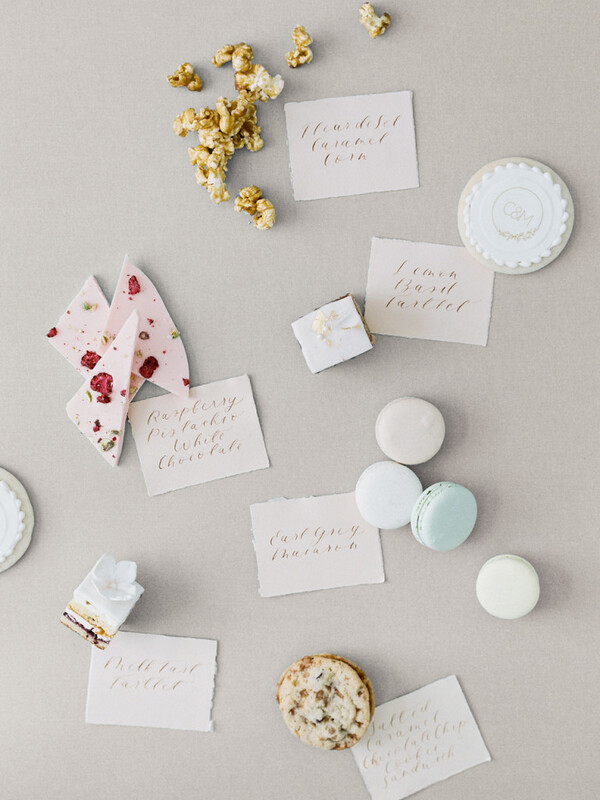 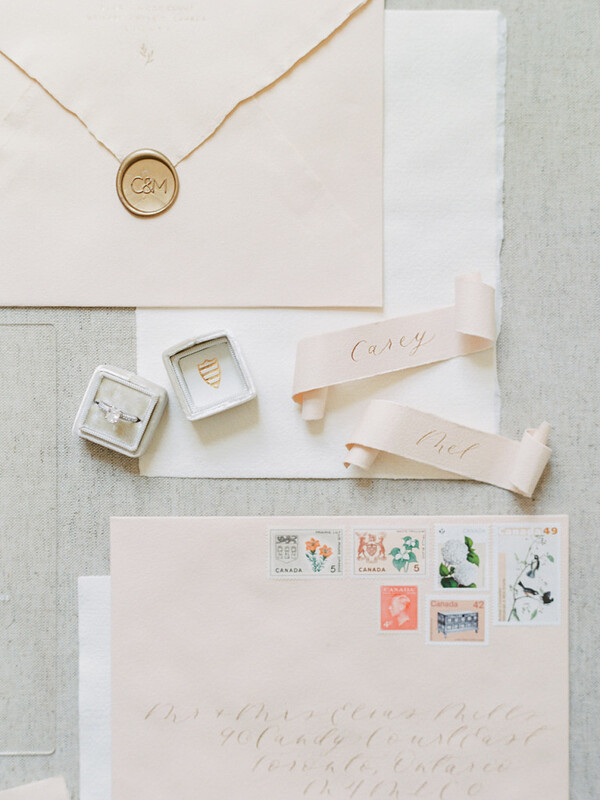 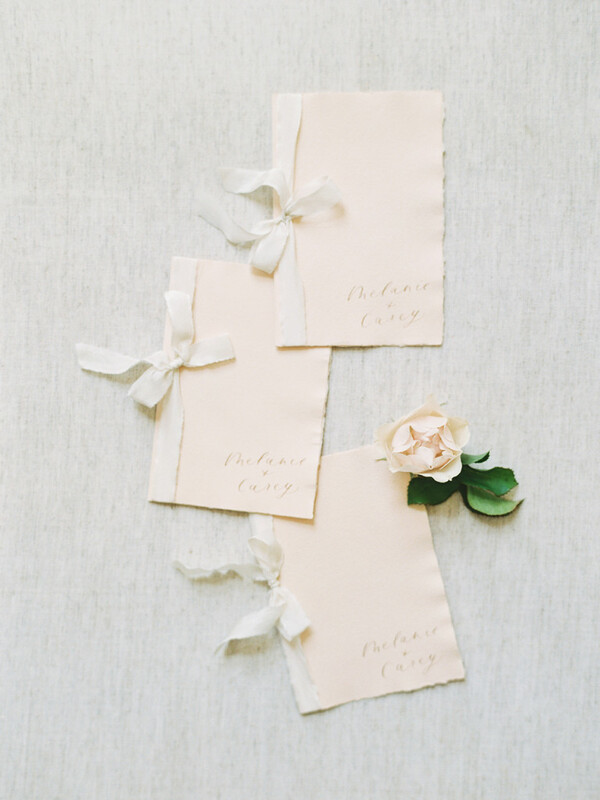 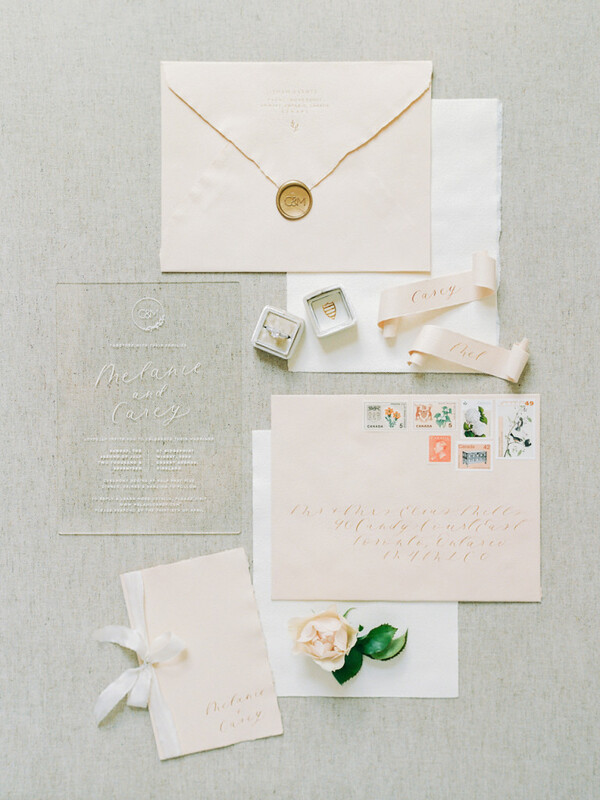 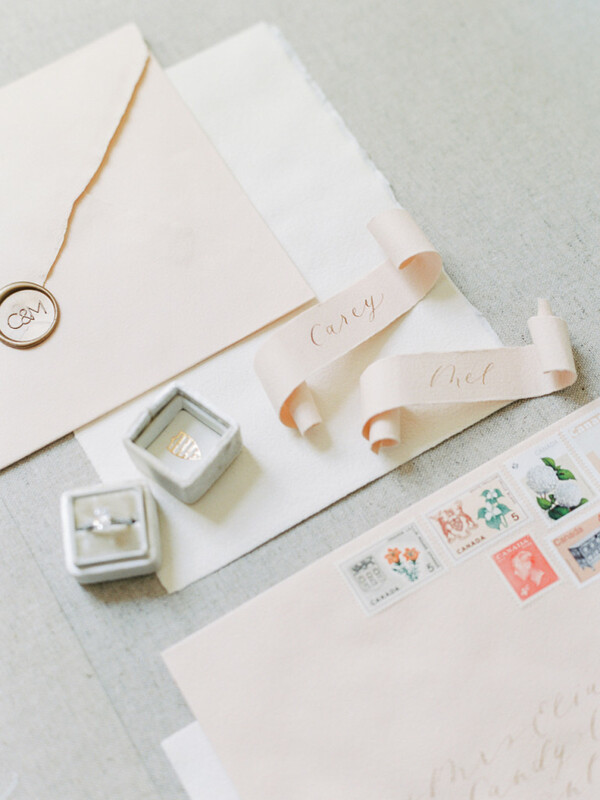 They paired with the softest shade of blush envelopes, that were calligraphed with guests addresses in sparkling gold ink. 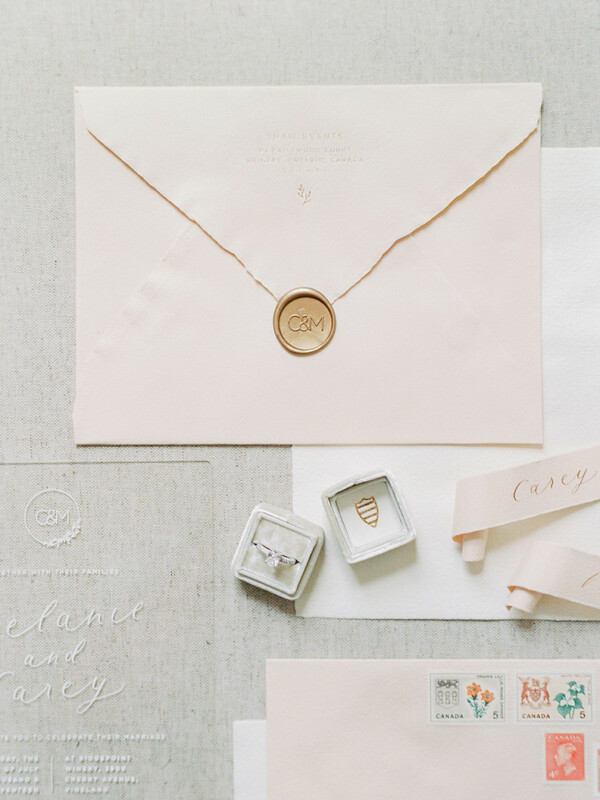 They had a gold foil letterpressed reply address along the back and a large gold wax seal with their custom monogram. 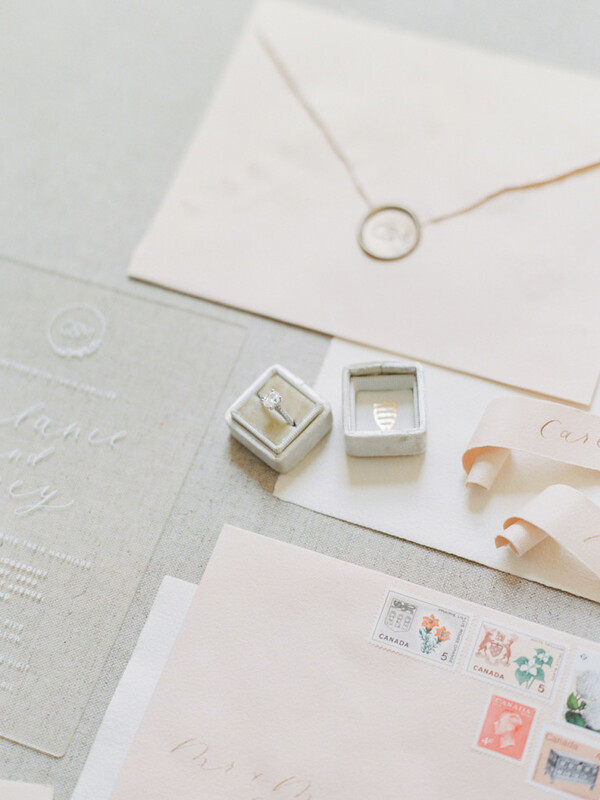 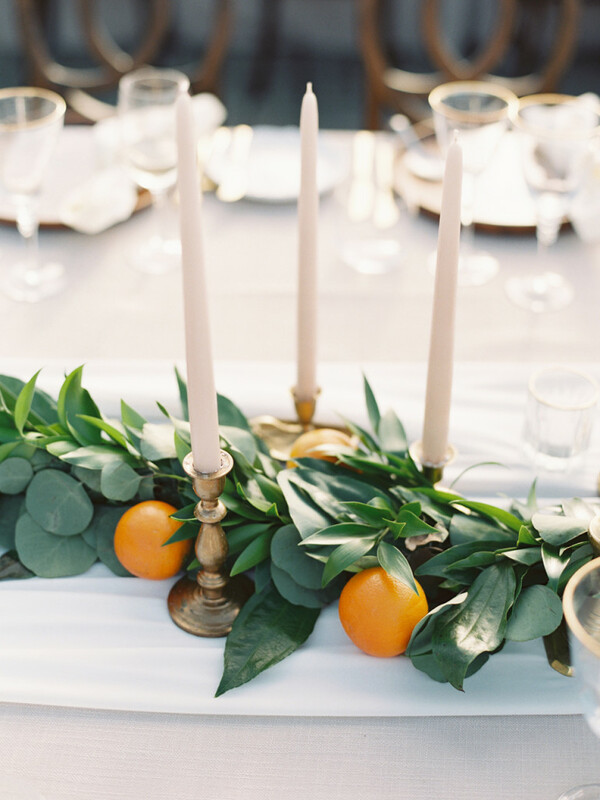 The suites were finished with a gorgeous collection of vintage stamps that added a touch of playfulness and incorporated their citrus orange accent colour. 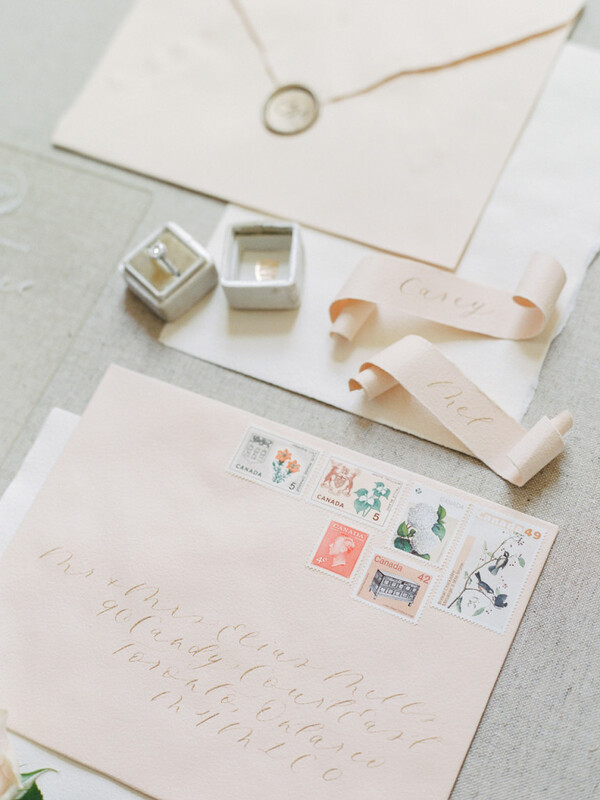 The day-of stationery components were thought through to the smallest detail. 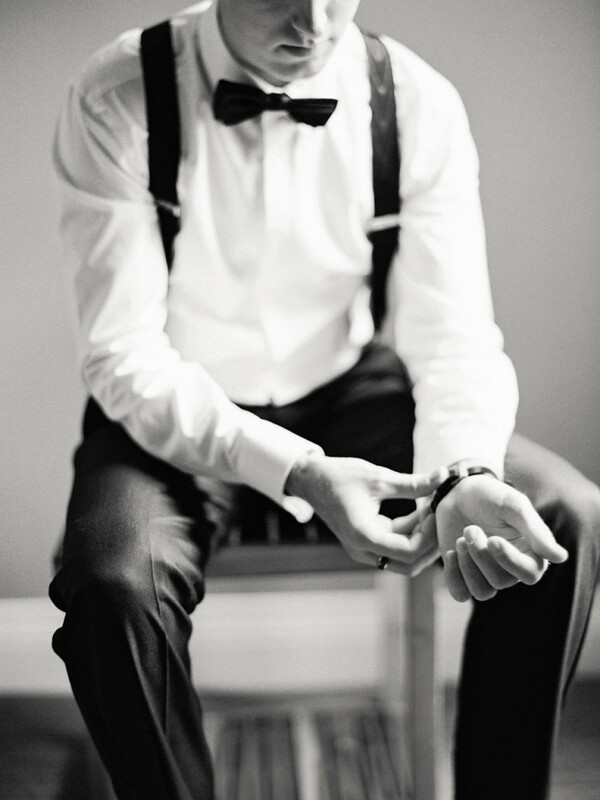 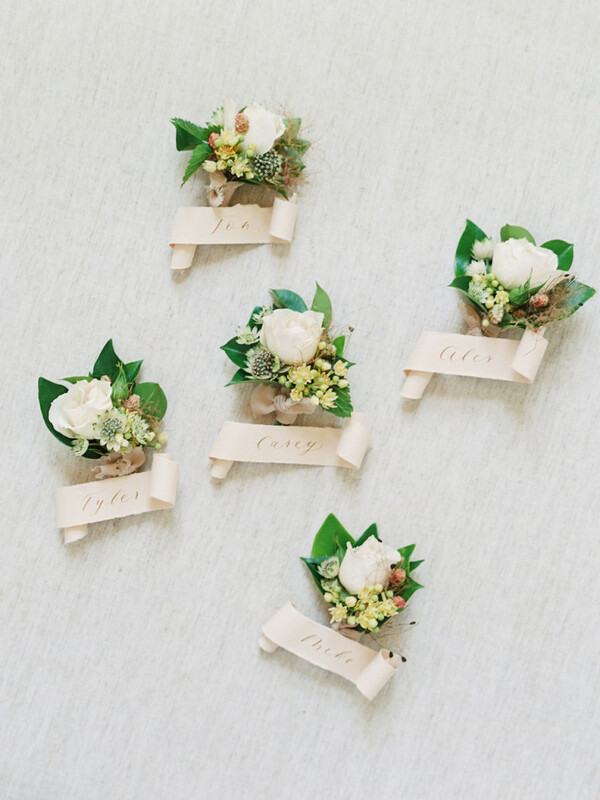 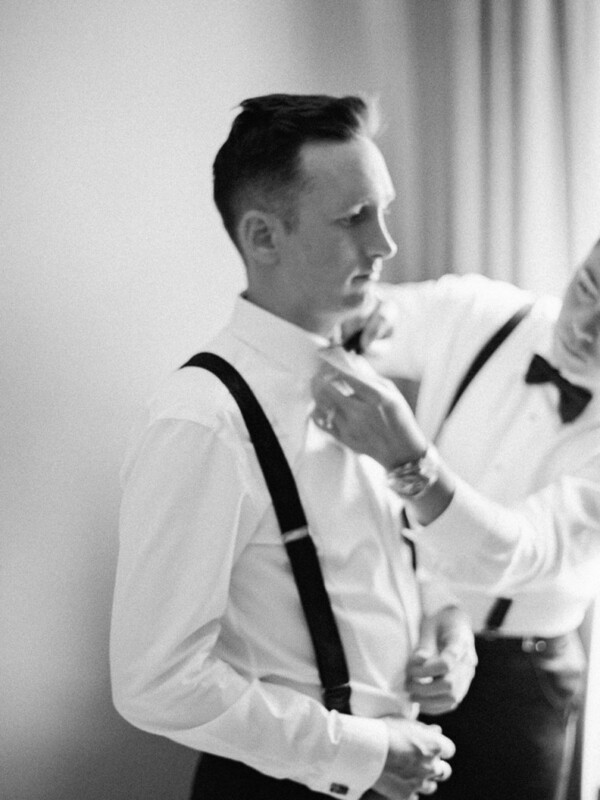 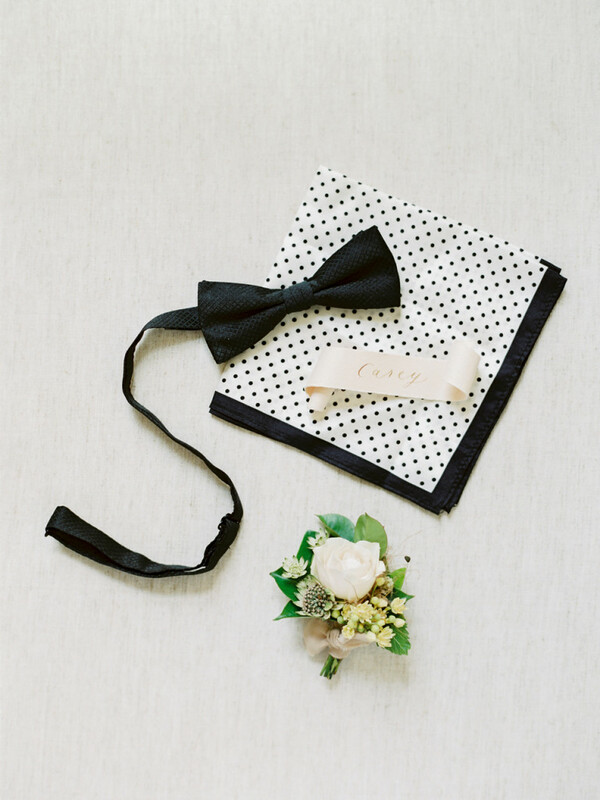 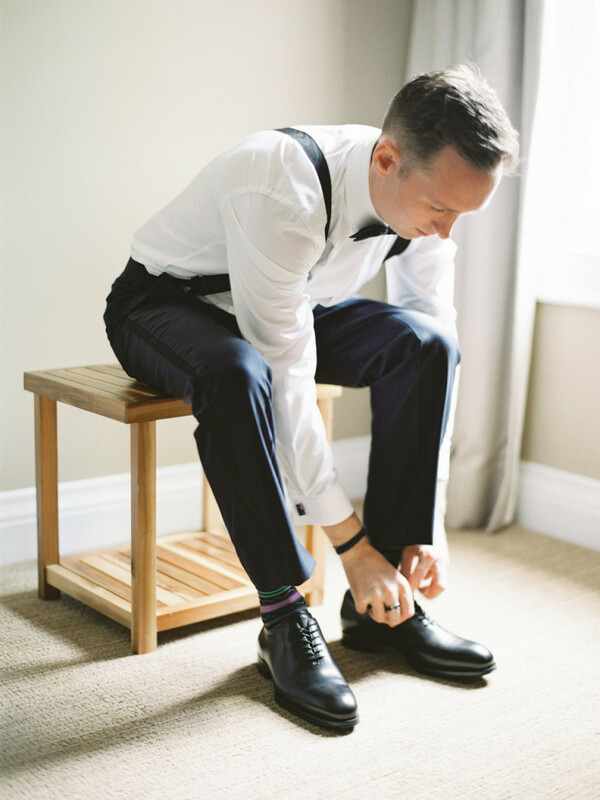 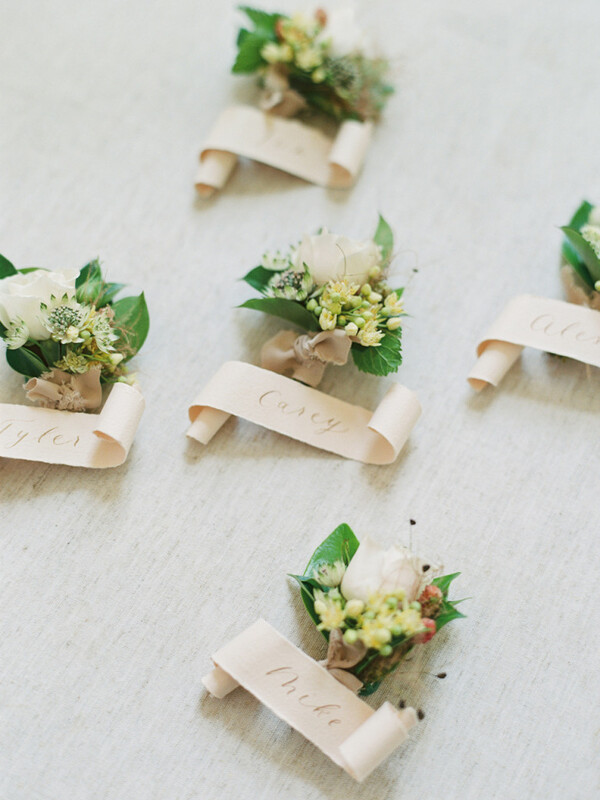 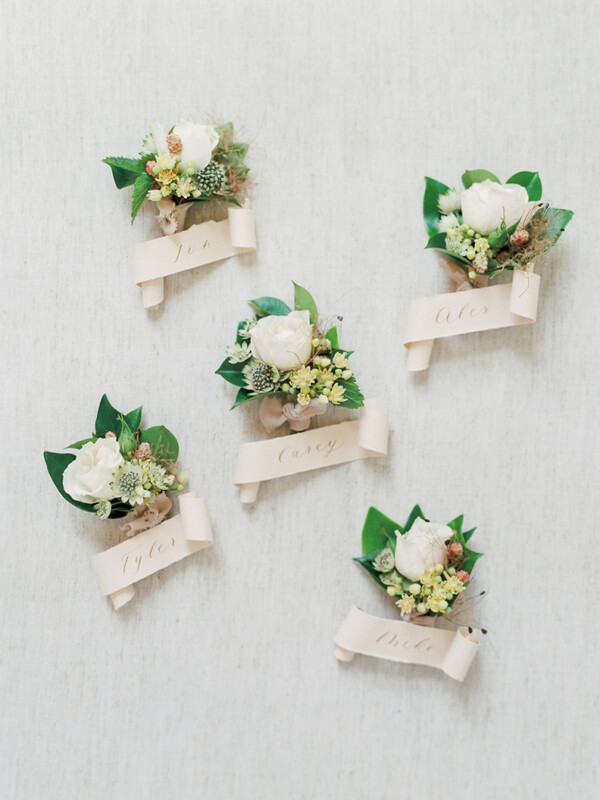 Custom groomsmen tags were incorporated to showcase the lovely boutonnieres that Kalin of Bloom & Co. created. 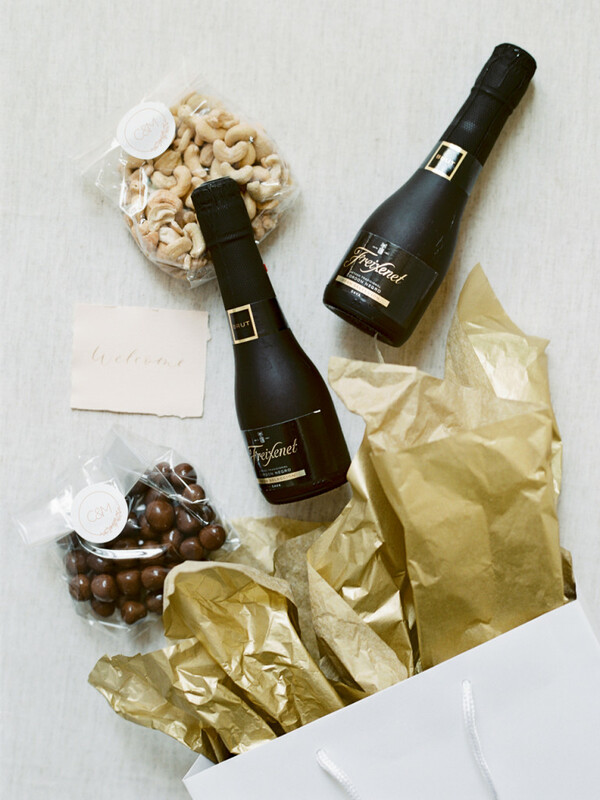 Welcome gifts were thoughtfully gifted to all of their out-of-town guests with treats and wine that included their branded stickers and hand-calligraphed welcome tags. 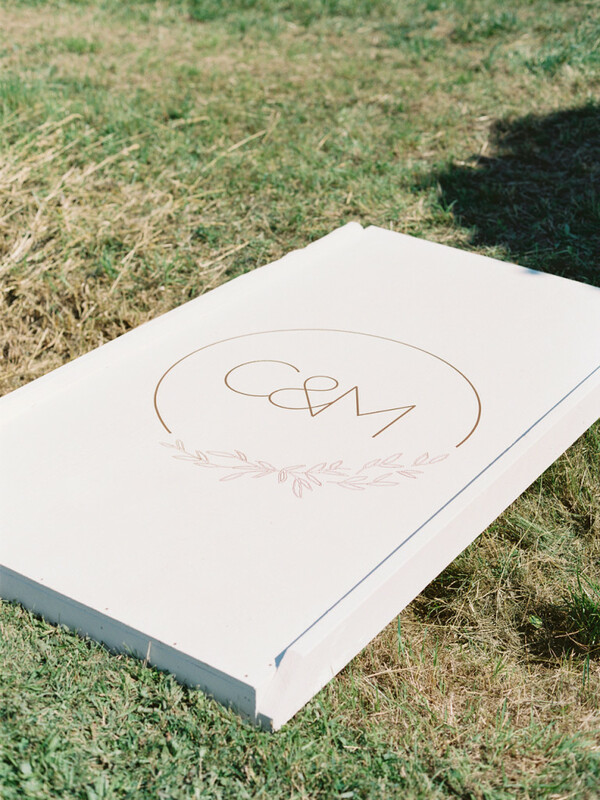 When guests entered the ceremony at Ridgepoint Winery, they crossed a bridge printed with monogram artwork and were met with a large lucite welcome sign. 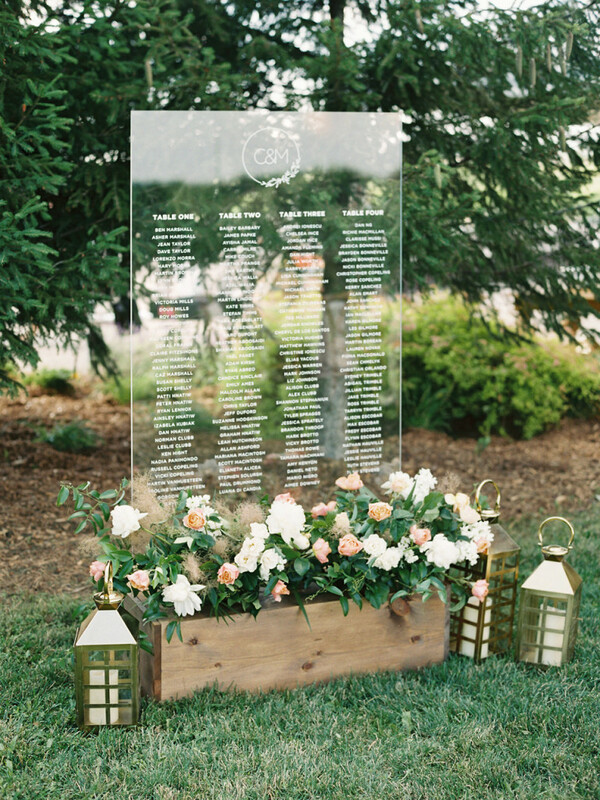 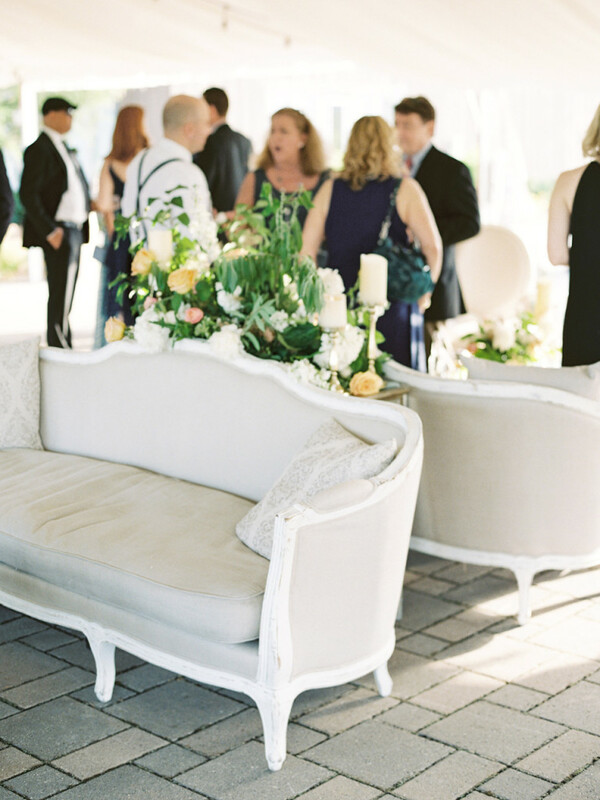 After the ceremony, guests relaxed during cocktail hour in the outdoor lounge, and perused the large lucite seating chart that was topped with their beautiful monogram. 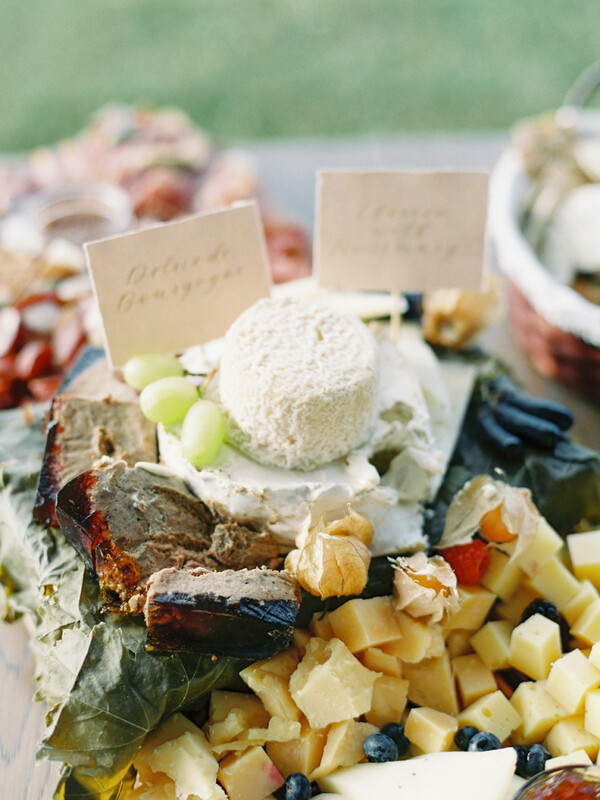 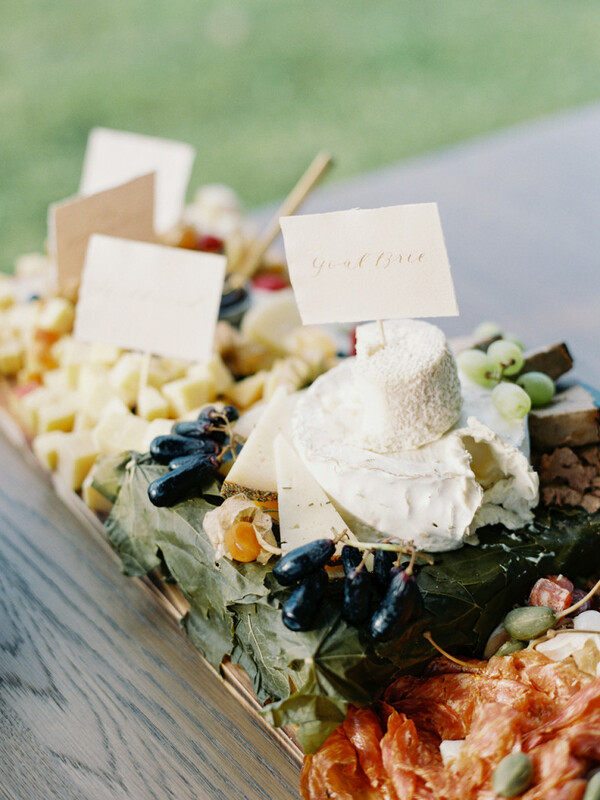 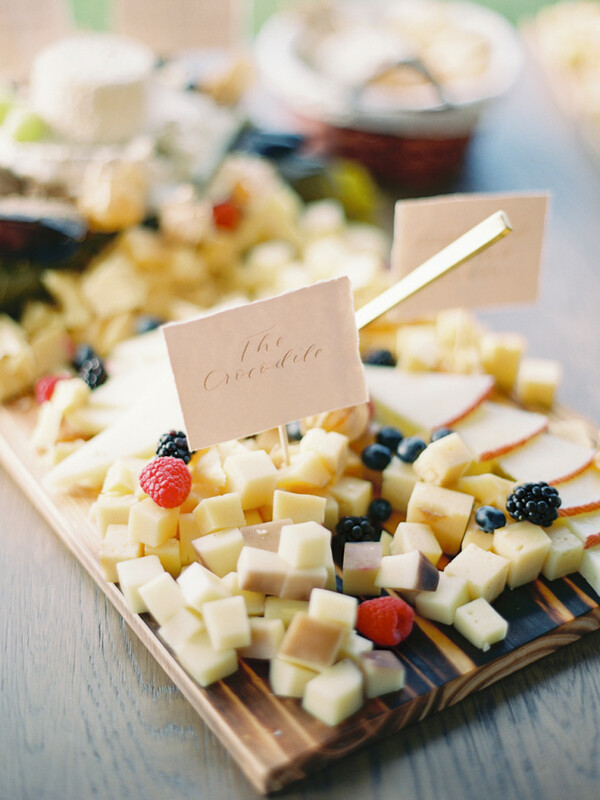 Charcuterie board dreams were made true with the decadent arrangement of cheeses that were displayed with their names calligraphed in gold ink on their corresponding blush handmade paper signs. 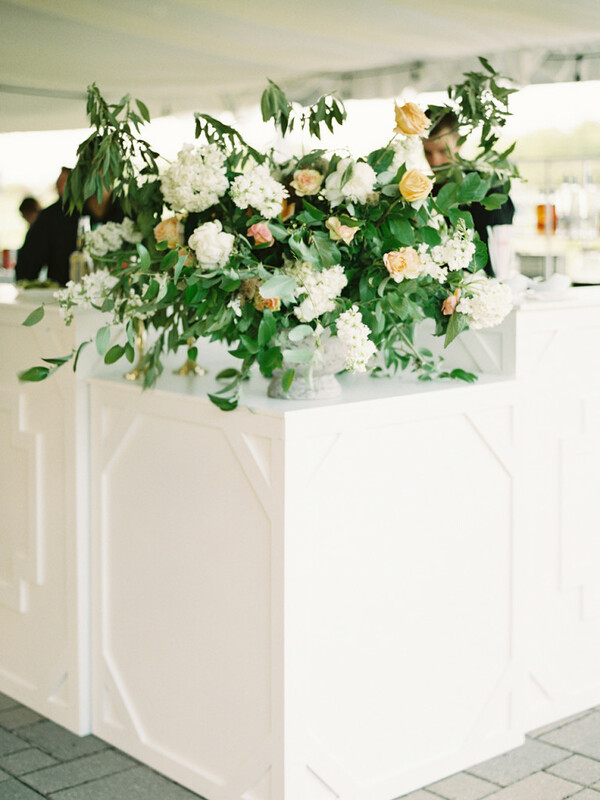 Guests sipped the couples’ signature drinks: Something Blue, Old Fashioned and Espresso Martini, and adored more of the beautiful lucite signage at the bar. 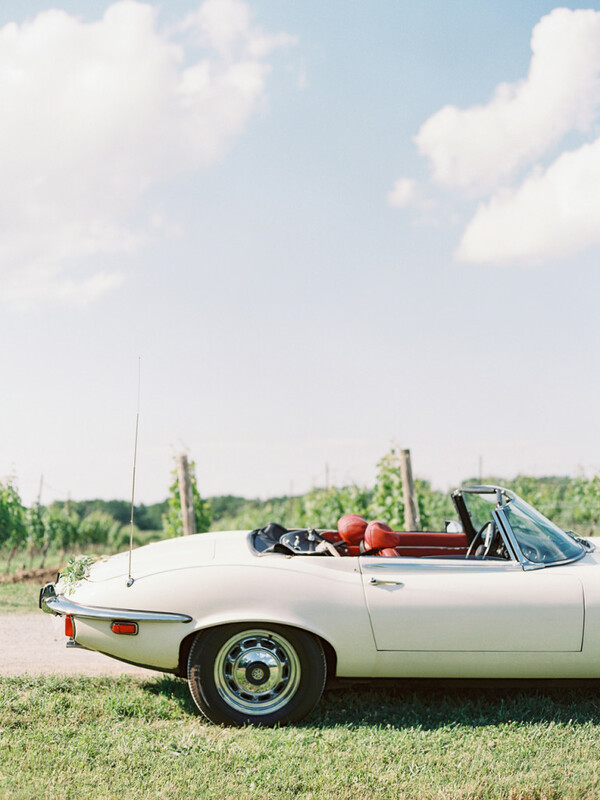 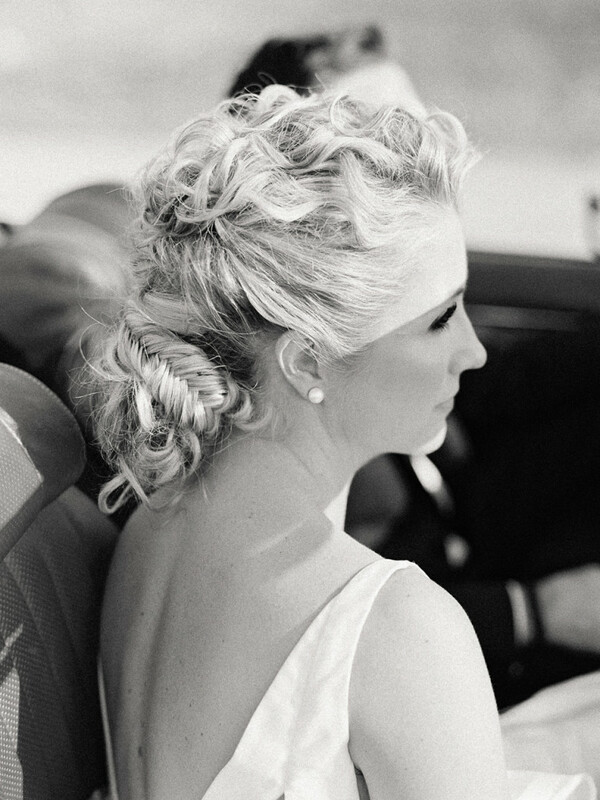 During cocktail hour, the couple went for a drive in Carey’s father’s vintage E Type Jaguar, which had been repaired and detailed especially for the wedding. 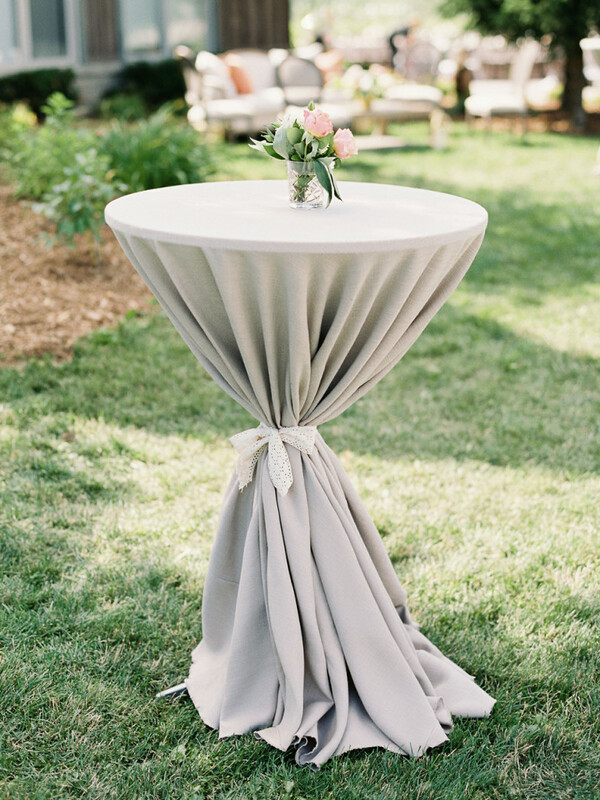 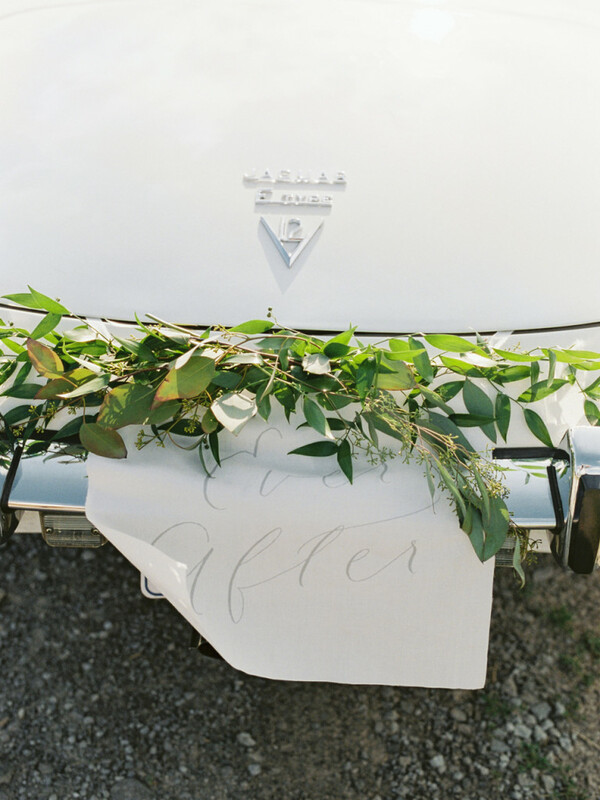 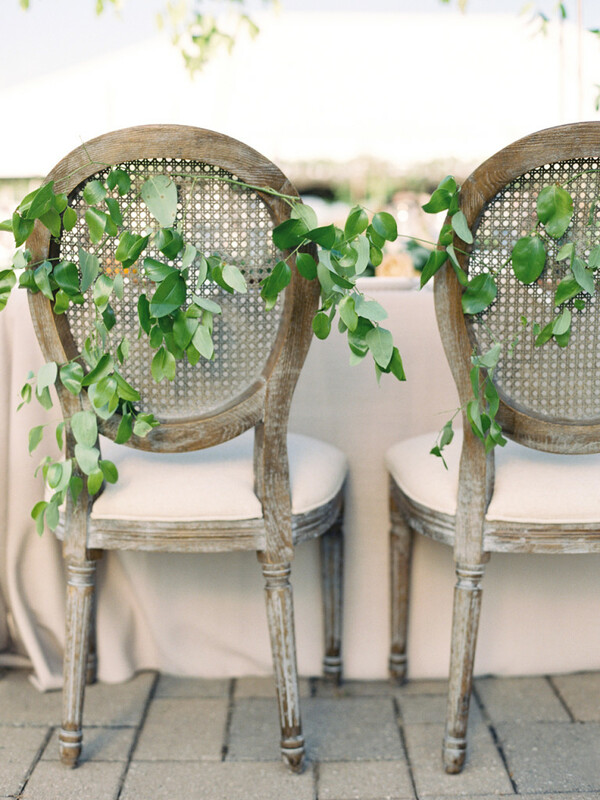 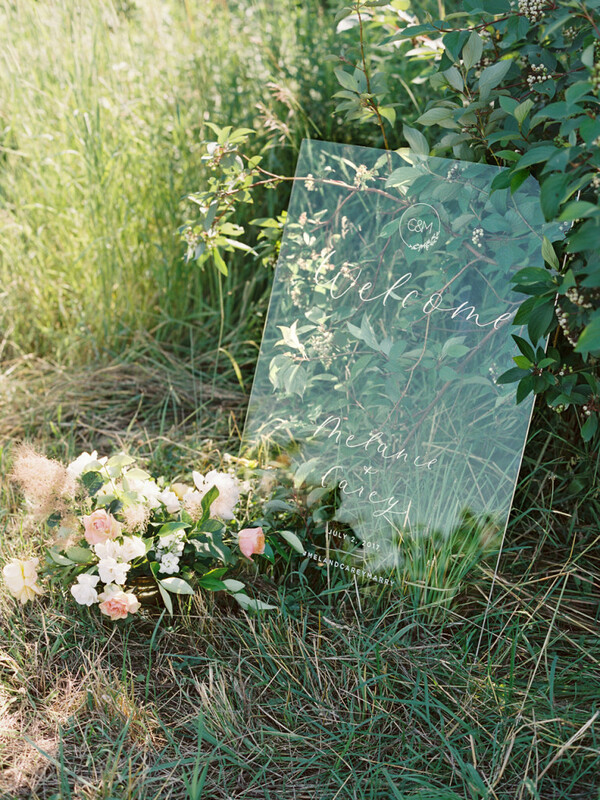 A fabric sign was adorned along the back with greenery and stated ‘Ever After’. 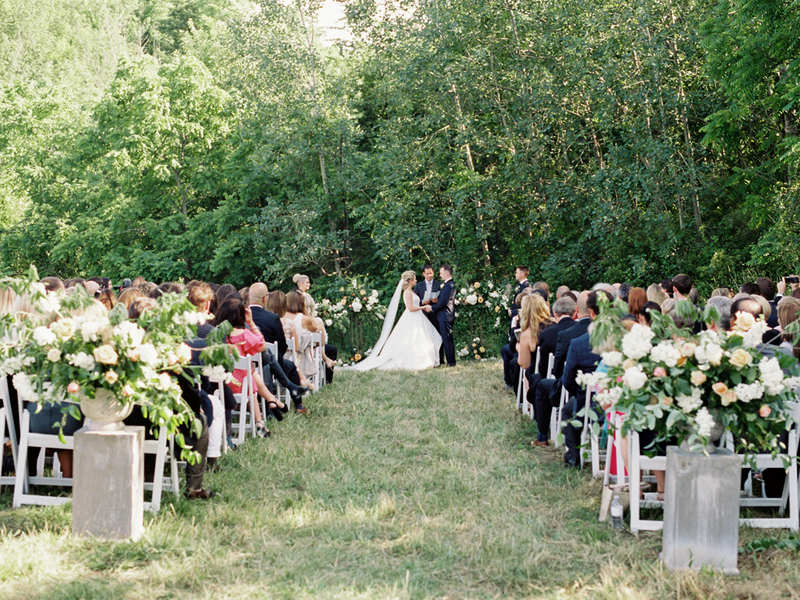 Guests were mesmerized as they walked into the outdoor reception space. 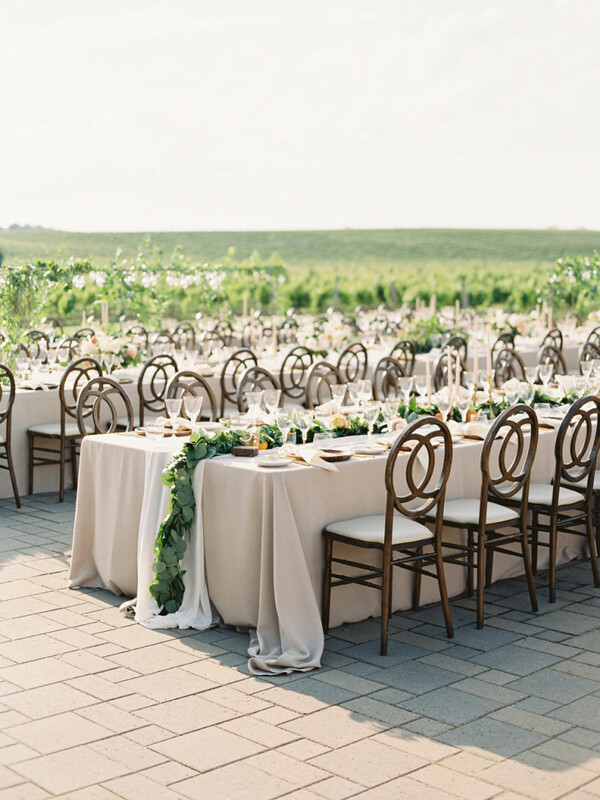 Four long harvest tables were used to seat their 150 guests, with Melanie and Carey switching tables between each plated course to sit with a new table of friends and family. 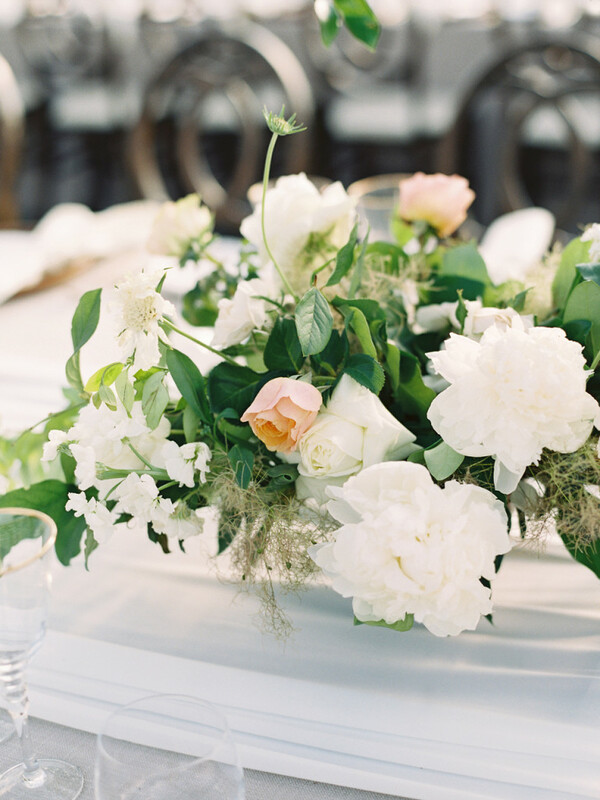 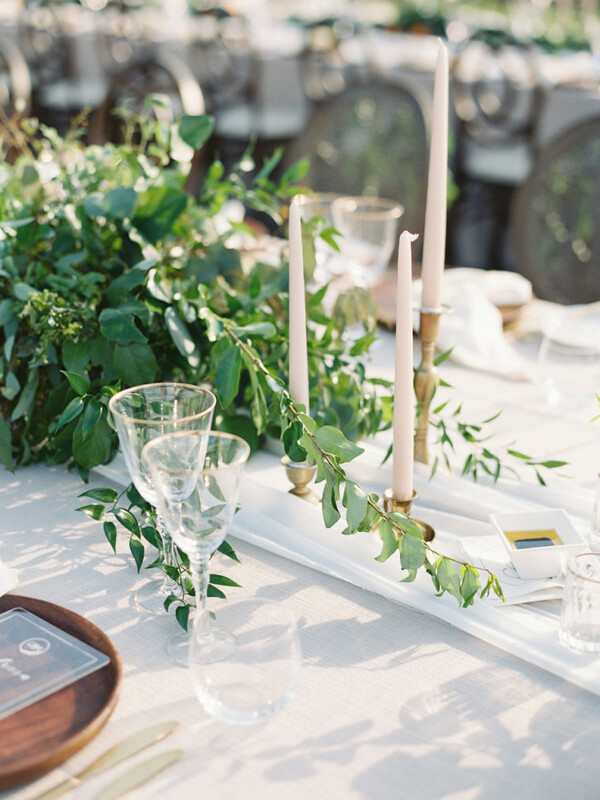 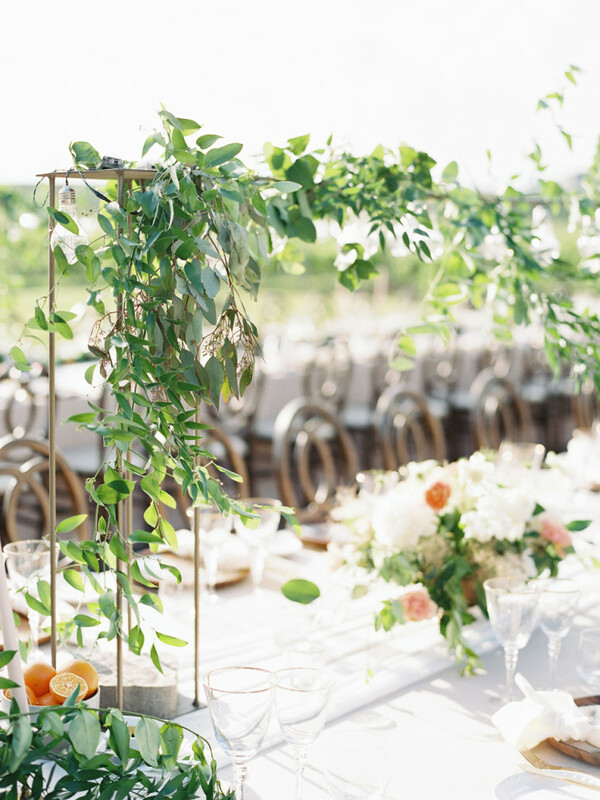 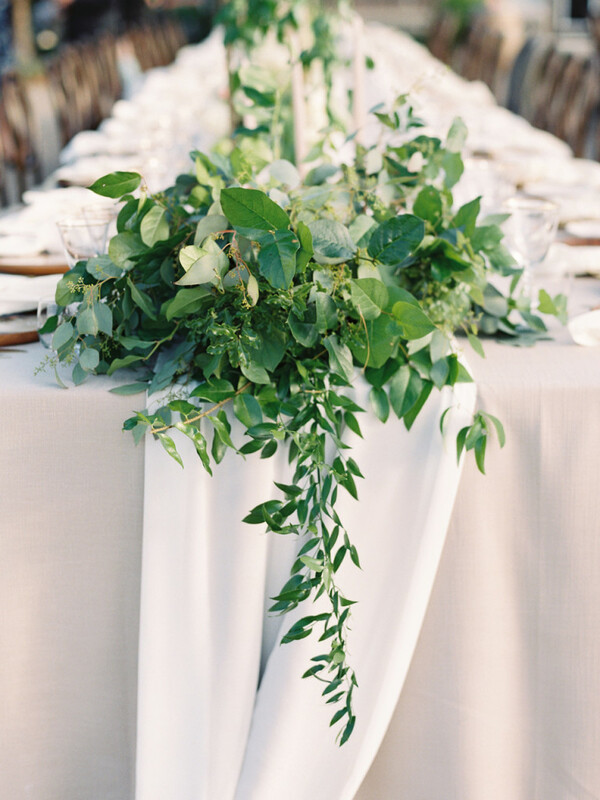 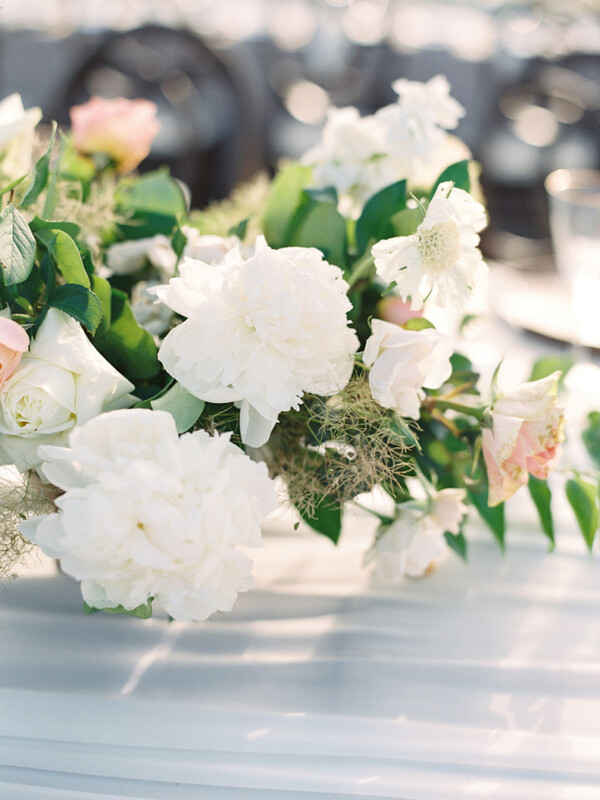 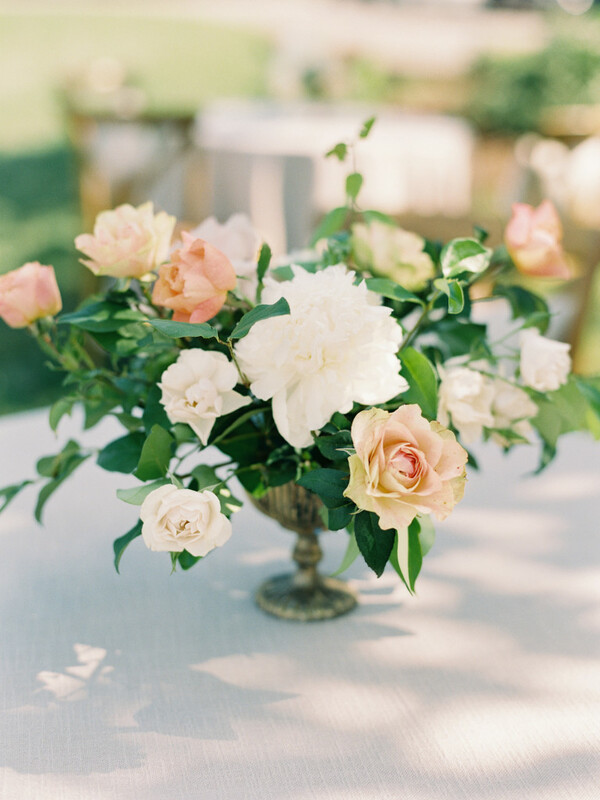 Tables had varying styles of florals, with large arrangements of greenery and delicate flowers, garlands, elevated portions with lightbulbs suspended and decorated with greenery. 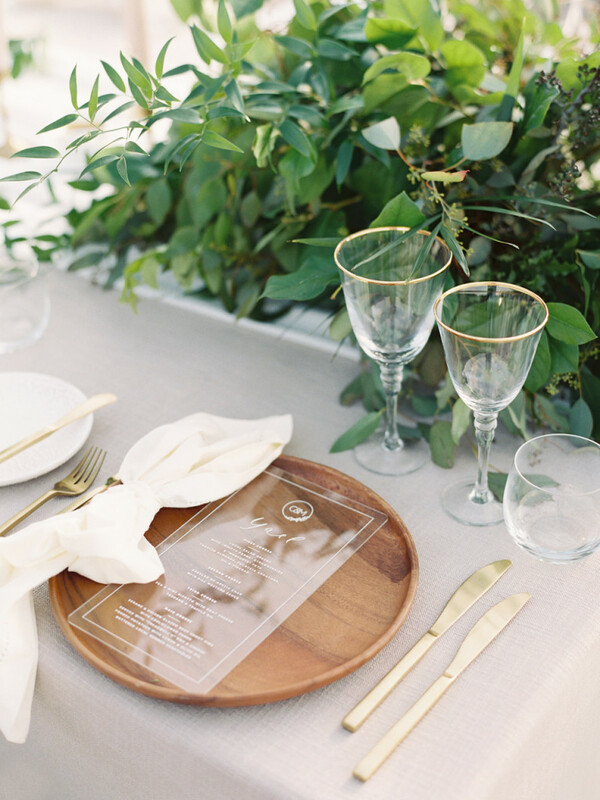 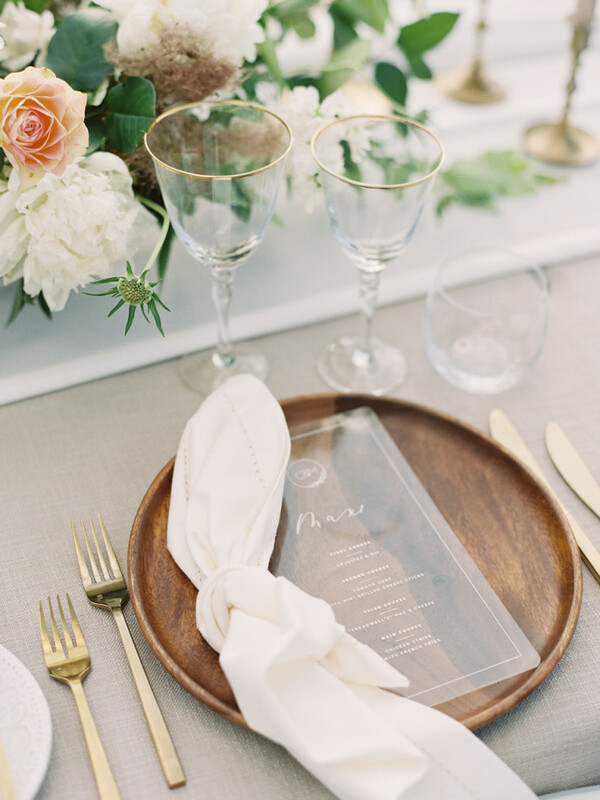 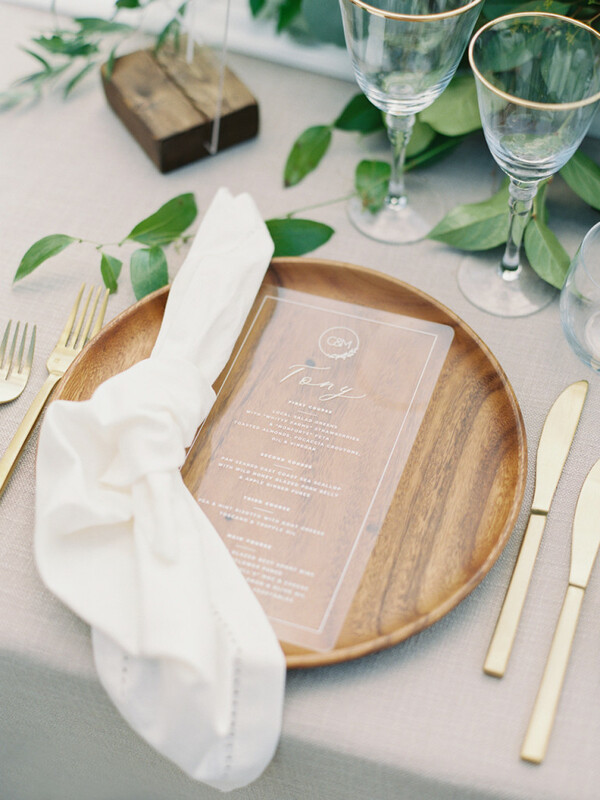 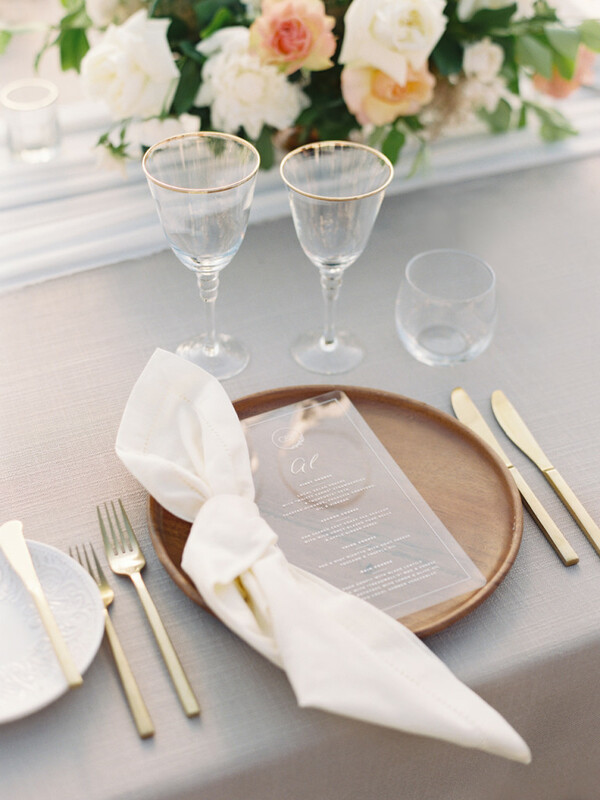 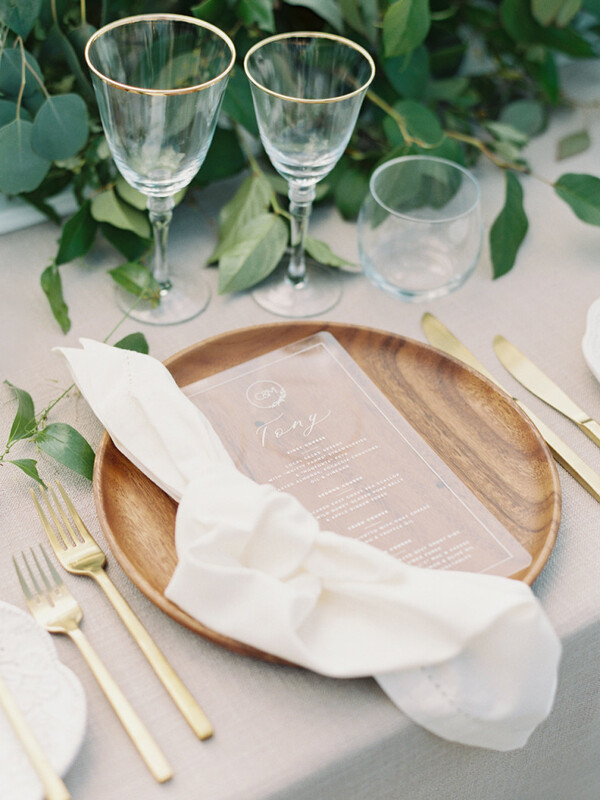 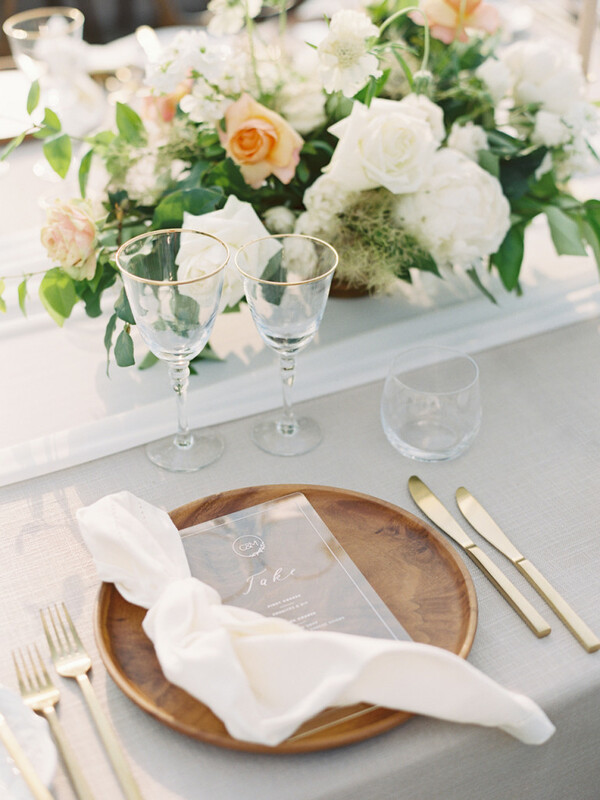 Neutral oatmeal-toned linens were used with classic gold and crystal flatware and stemware, and beautiful rich wooden chargers. 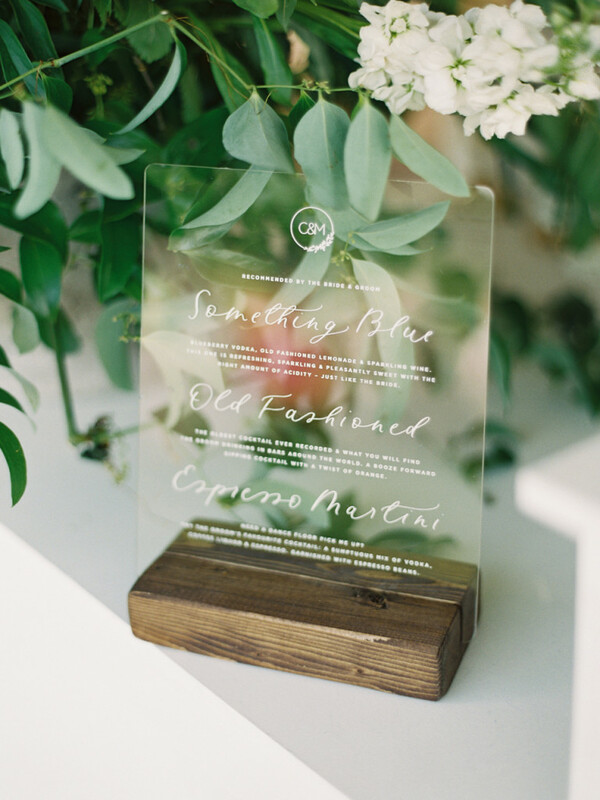 We crafted each menu to be personalized to each guest, by including their name in calligraphy along the top and their specific menu selection. 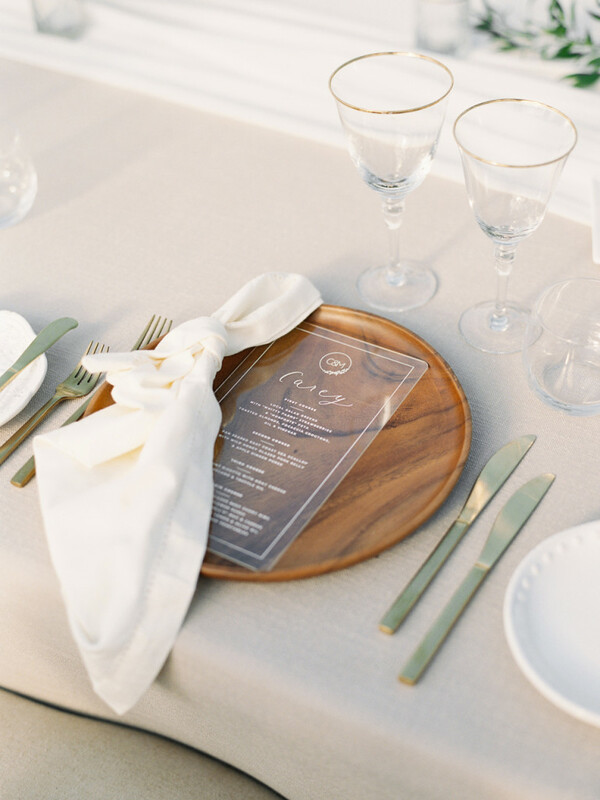 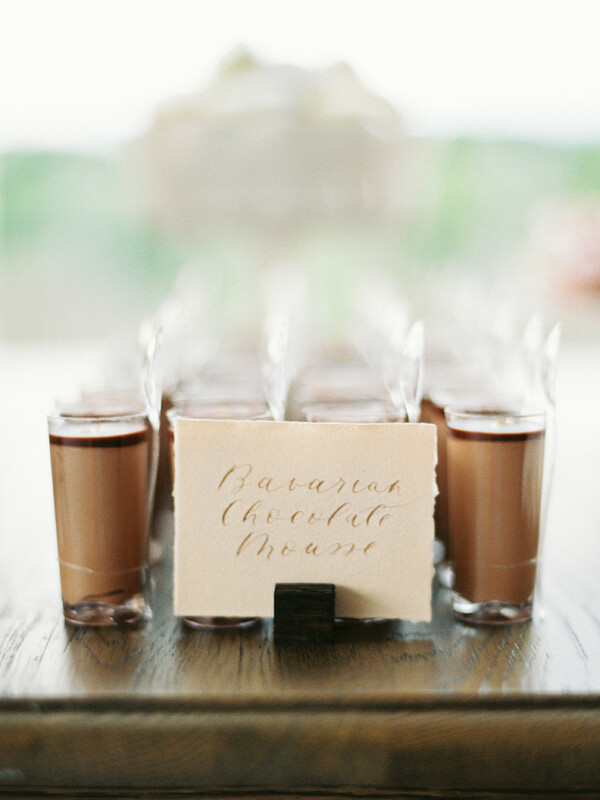 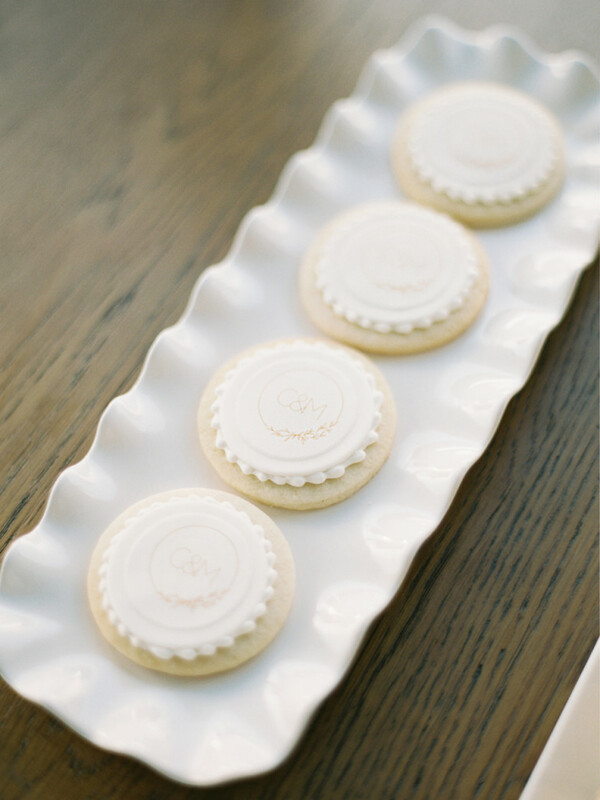 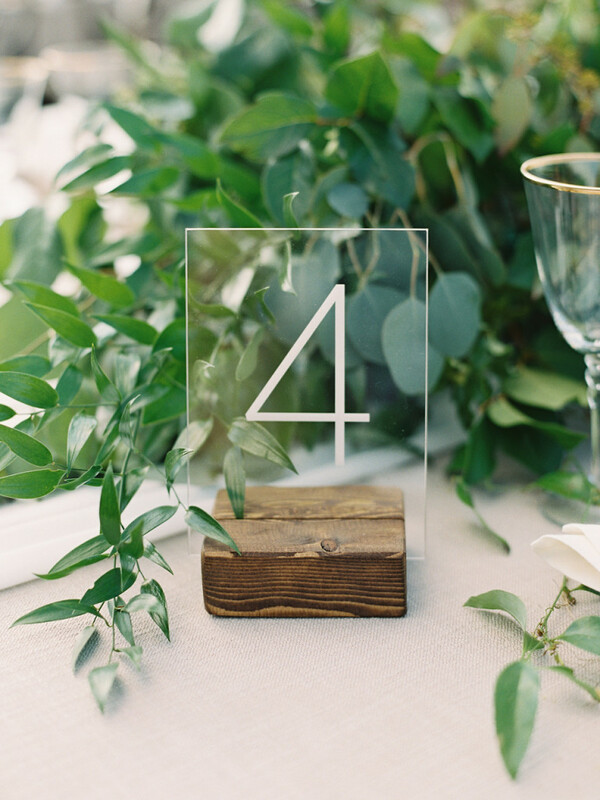 Guests adored these and were super impressed by this precious momento that was placed atop the wooden charger, which created the perfect amount of contrast for legibility with their time-honoured white ink printed on the lucite. 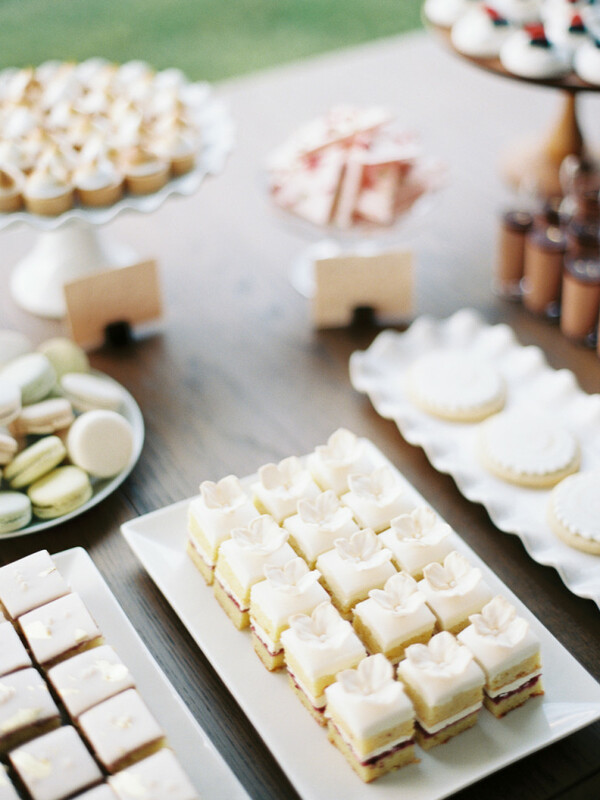 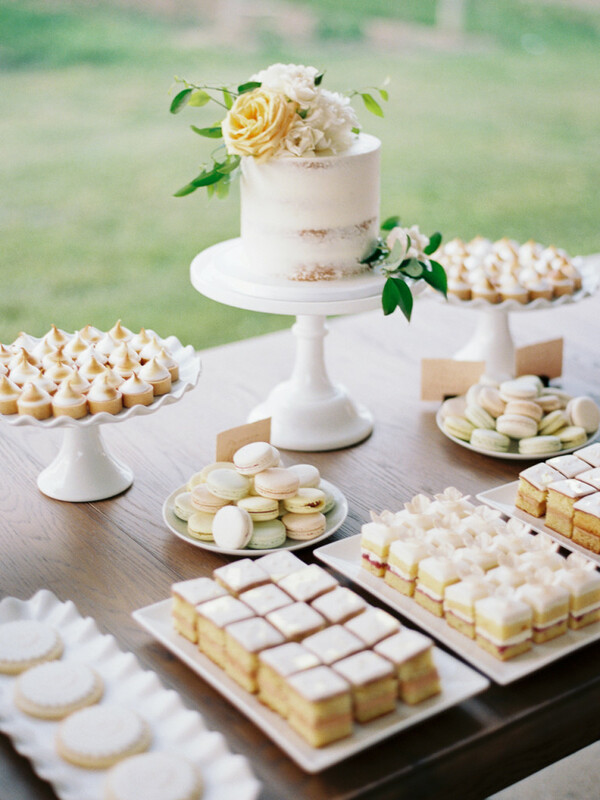 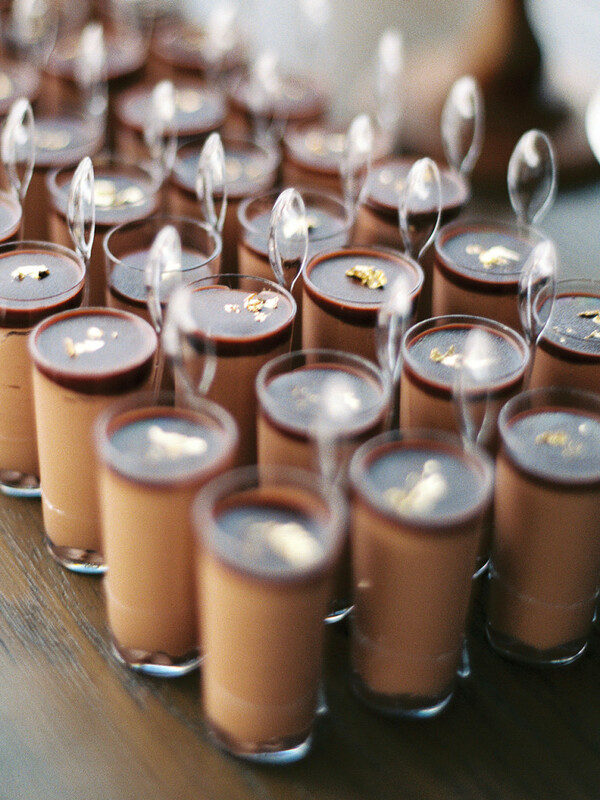 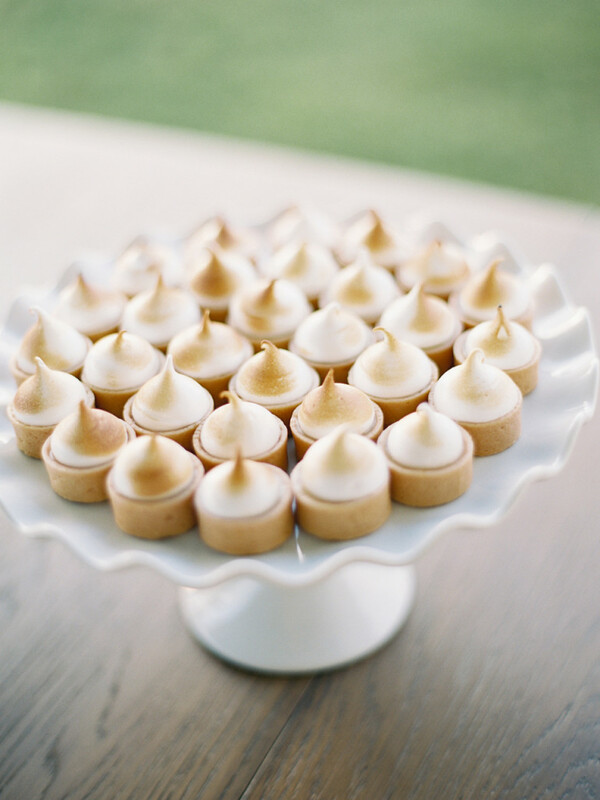 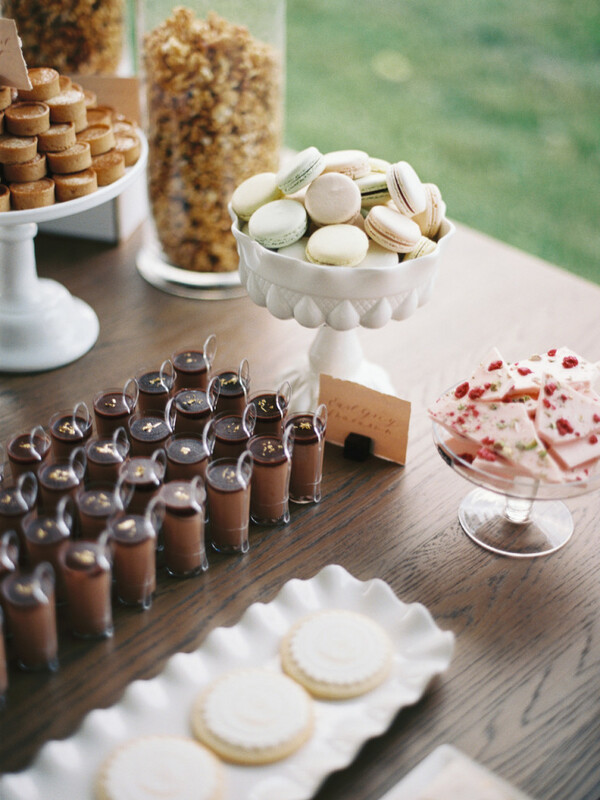 A favourite detail of the day was their elaborate dessert table, put together by the lovely Marcia of The Dessert Room. 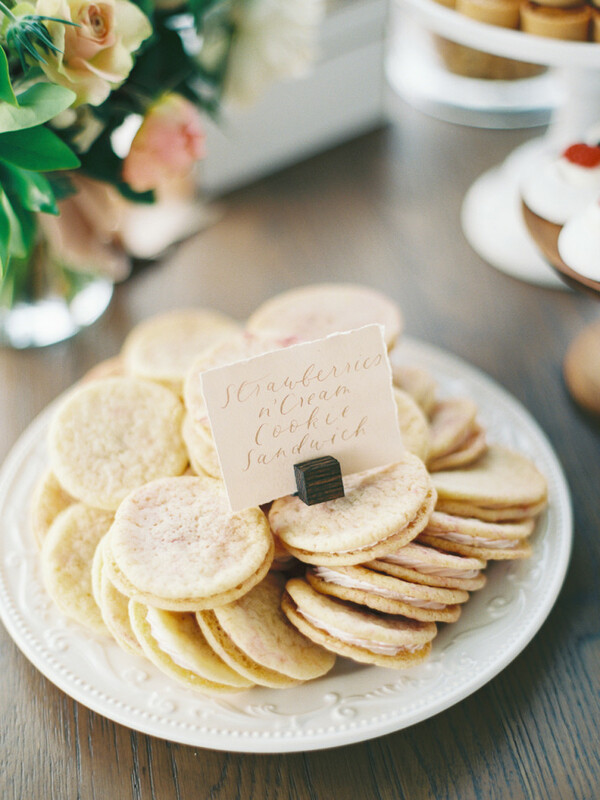 We incorporated more gold calligraphy signage for all of the treats, and they had their custom branding printed on delicate sugar cookies. 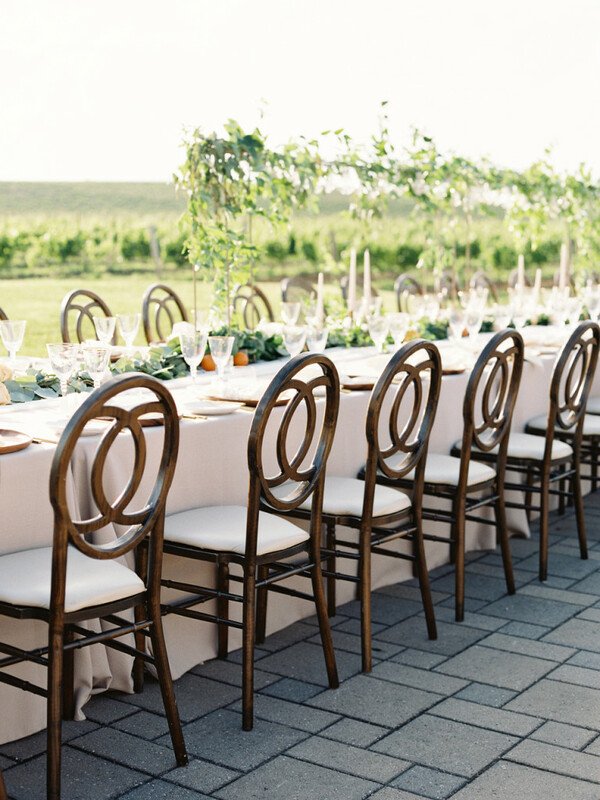 I absolutely loved playing a design role with this incredible team of vendors. 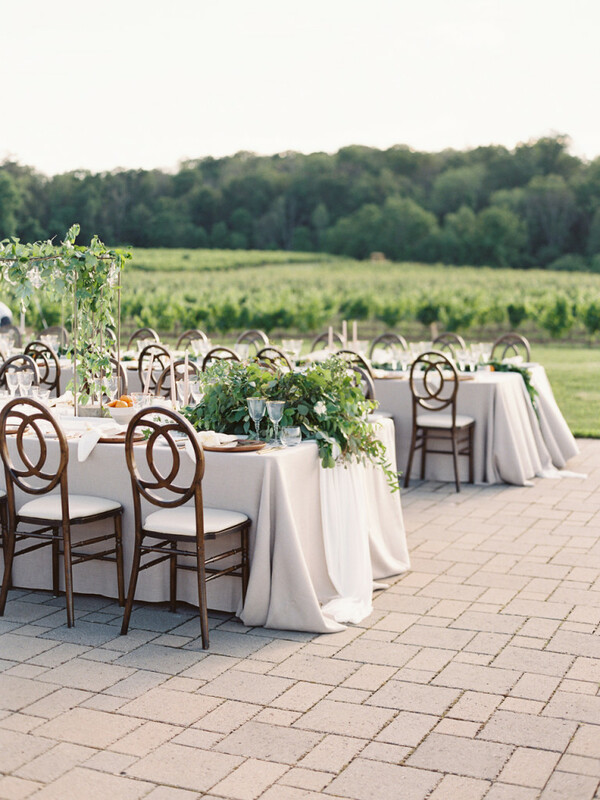 Special thanks to Danielle of Shaw Events for dreaming up so many of these wonderful ideas and executing such an amazing event! 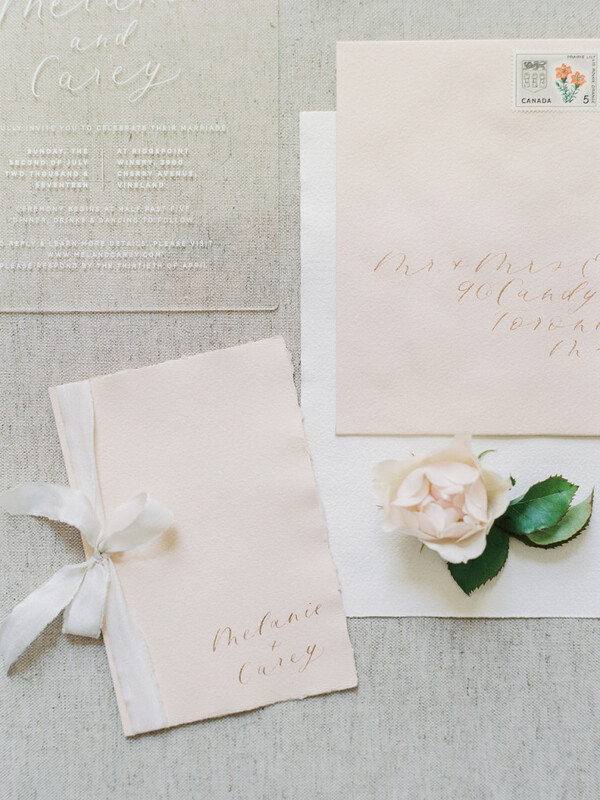 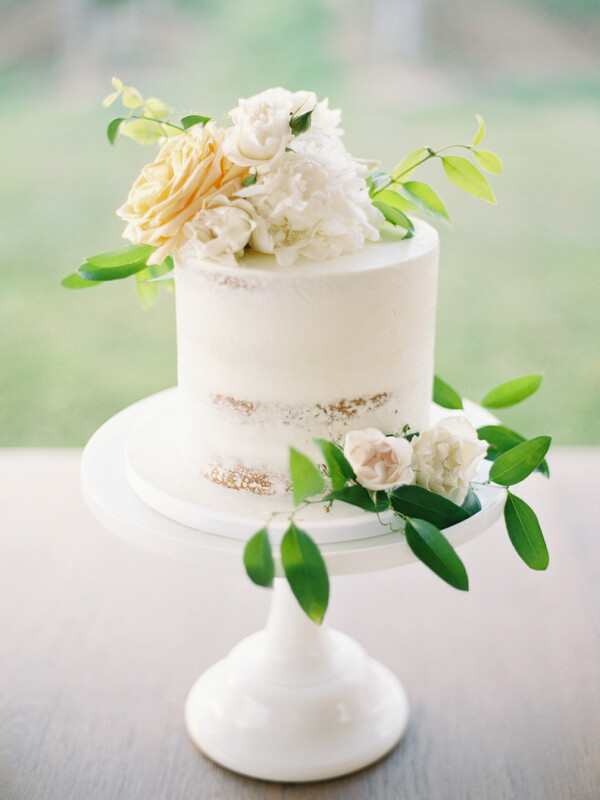 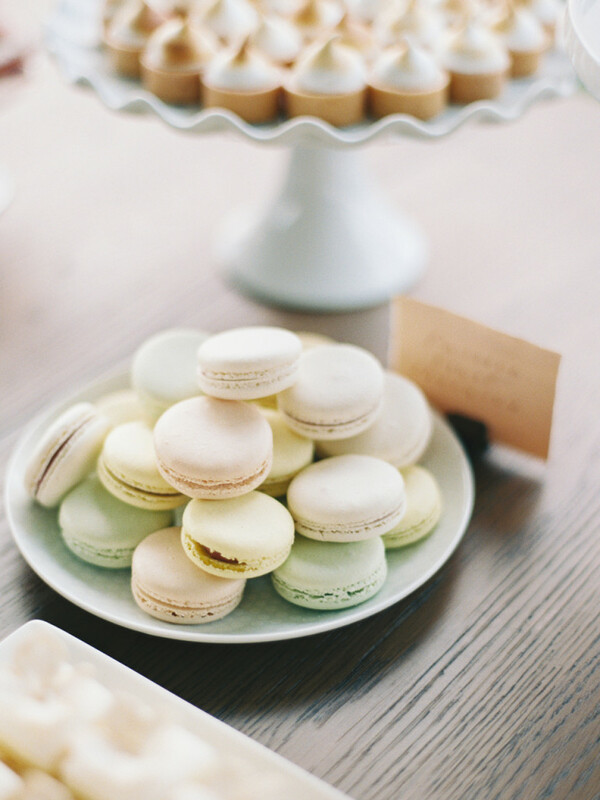 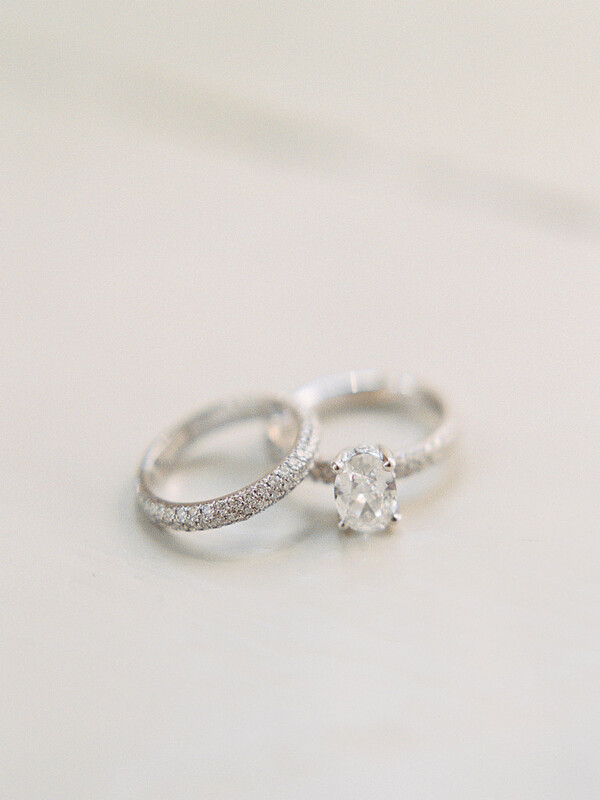 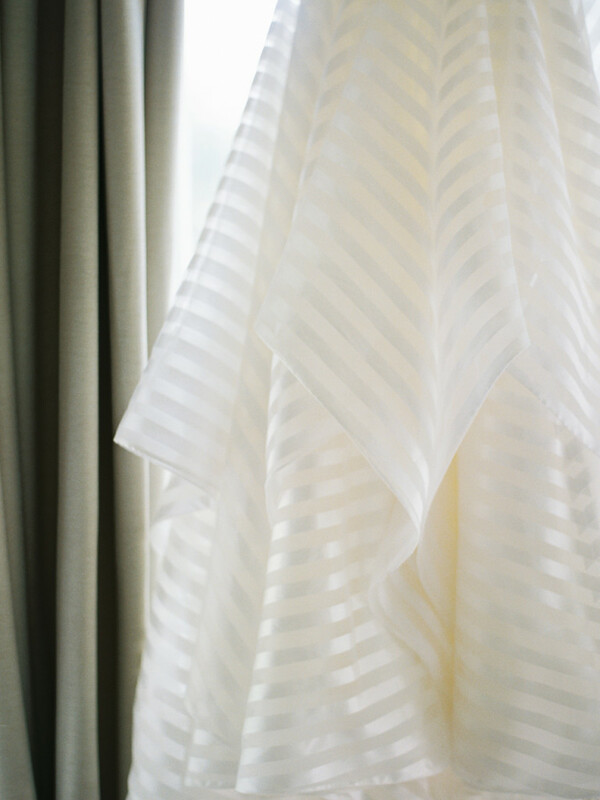 I can’t say enough amazing things about this planner – brides, take note! 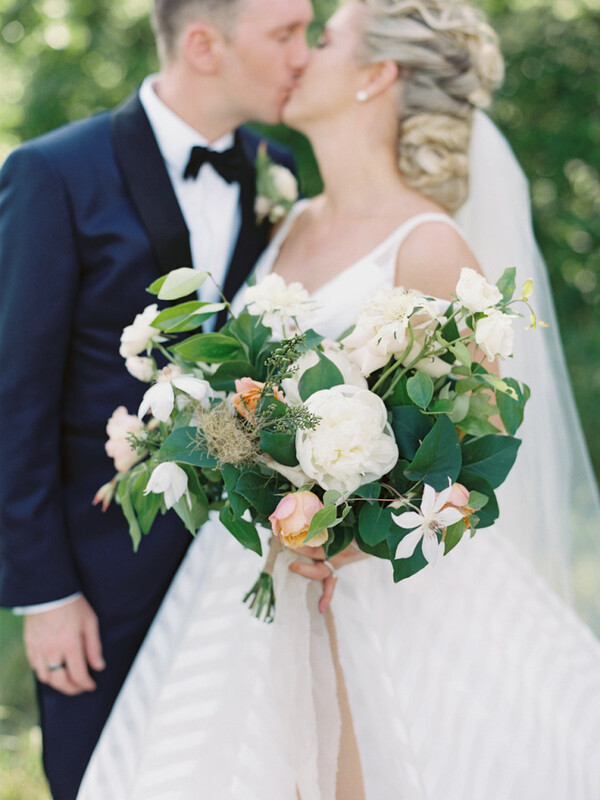 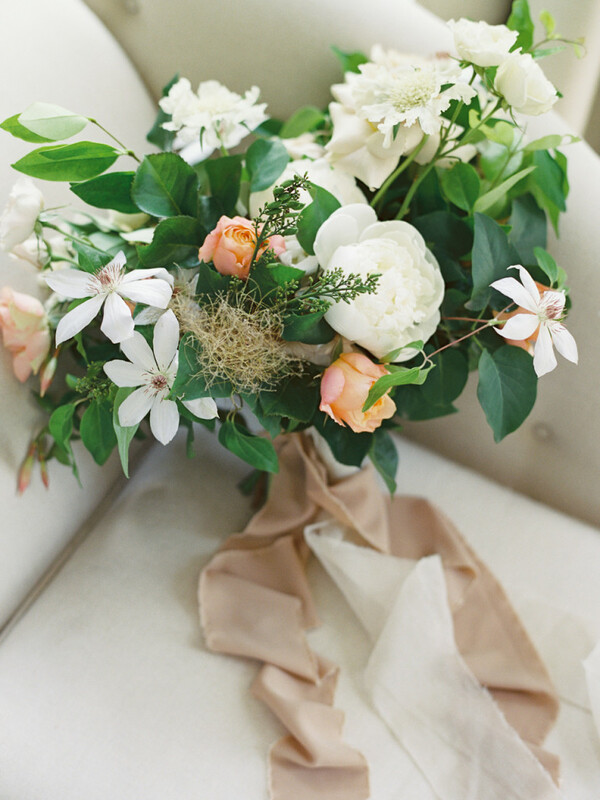 Published in the 2018 Fall/Winter issue Today’s Bride magazine.